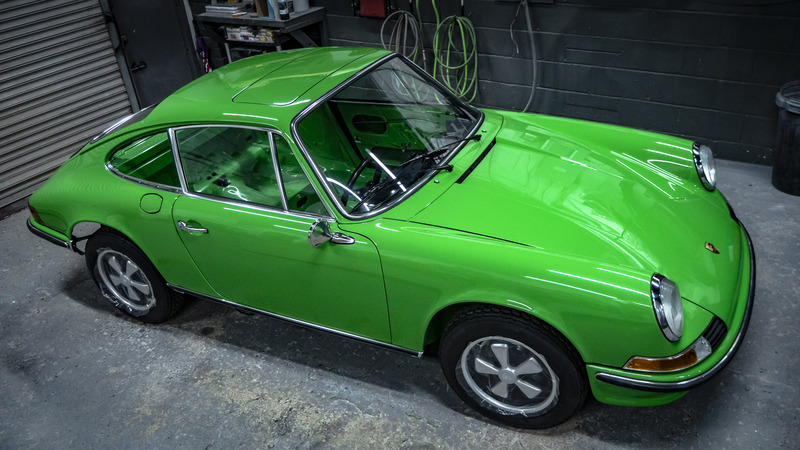 We at Golding Barn Garage love all cars but when something like this comes in for a full nut and bolt restoration we couldn’t keep it to ourselves and we hope to take you on the full journey. 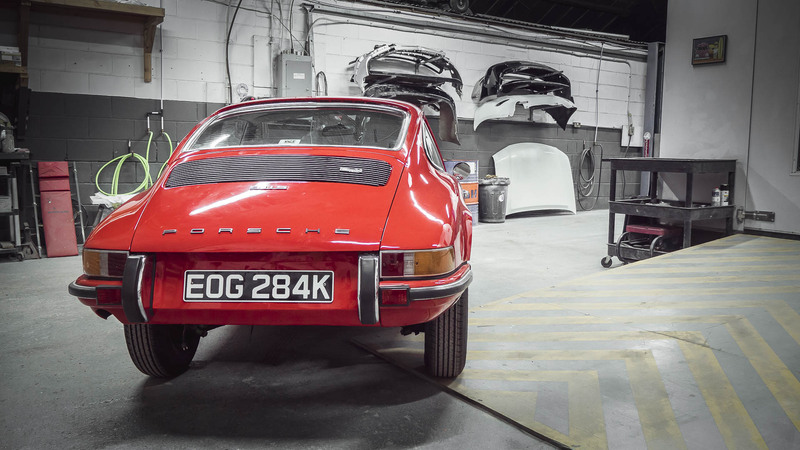 The good, the bad and the ugly! 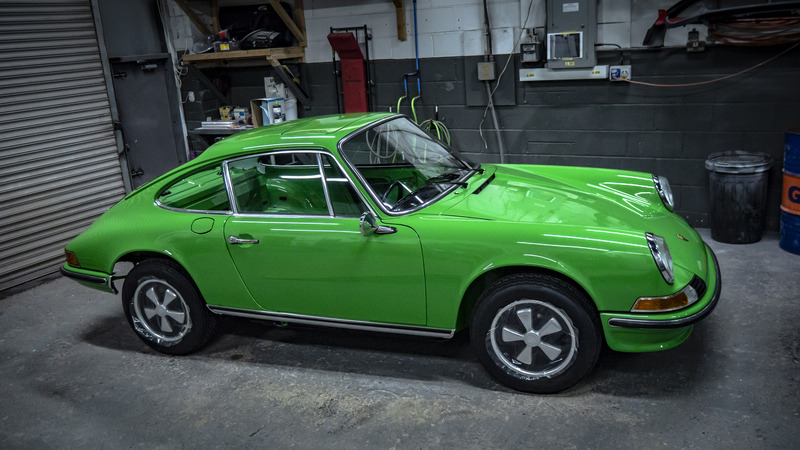 This 911s does 0-60mph in 6.6 seconds and a top speed of 144mph. 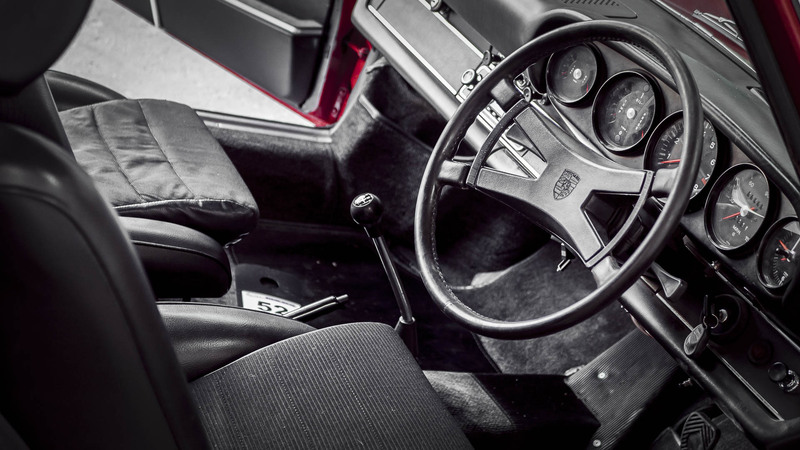 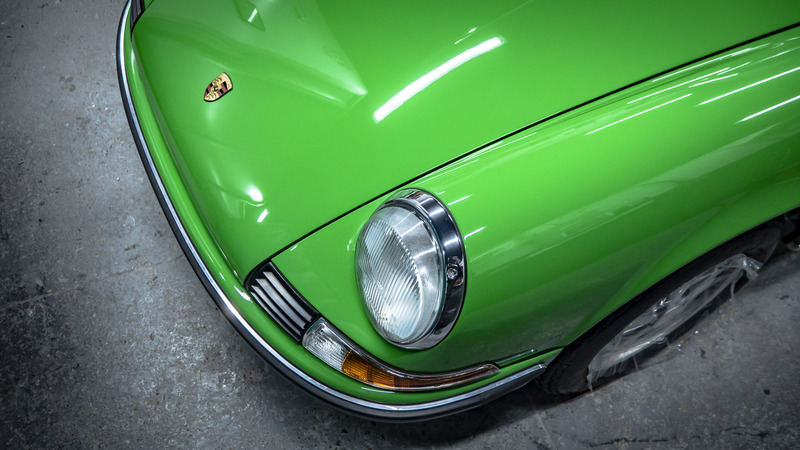 It was Porsches answer to the slower 246 Dino from Ferrari.For the 1972 model year, the oil tank was moved further forward to enhance the handling of the 911 and featured a distinctive oil flap on the right-hand rear wing where the oil could be topped up. 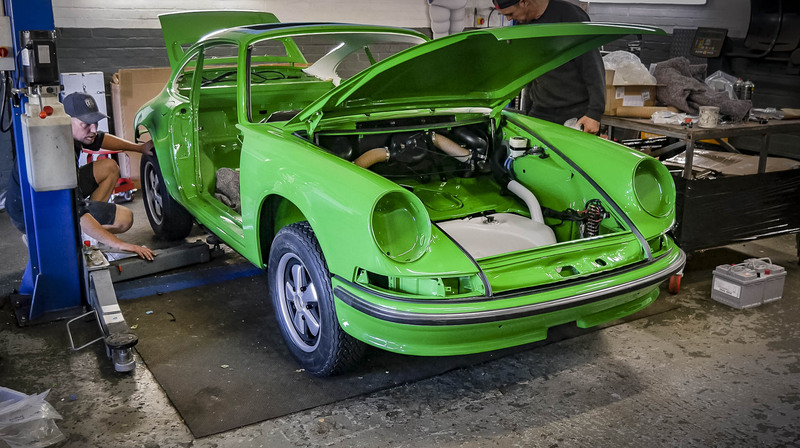 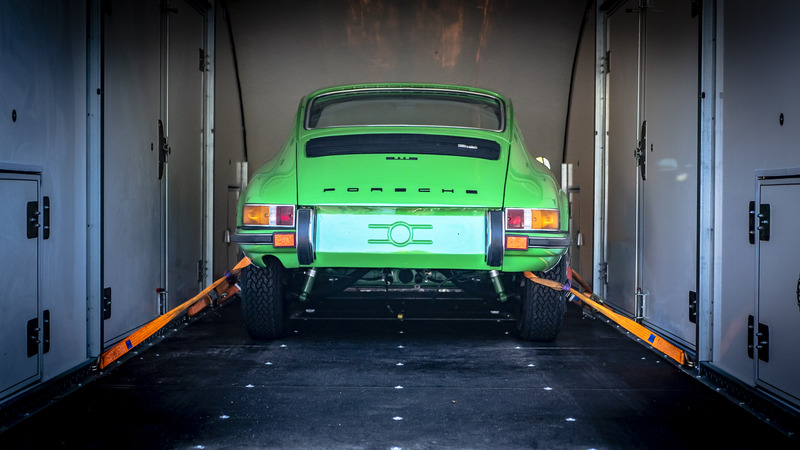 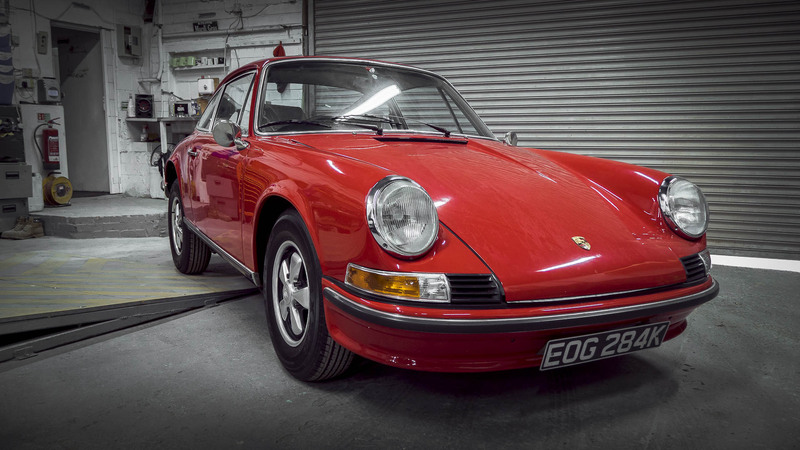 Unfortunately people would often use this by mistake to fill the car with fuel, so this feature was dropped for 1973 making these `oil klapper` 911s very rare today. 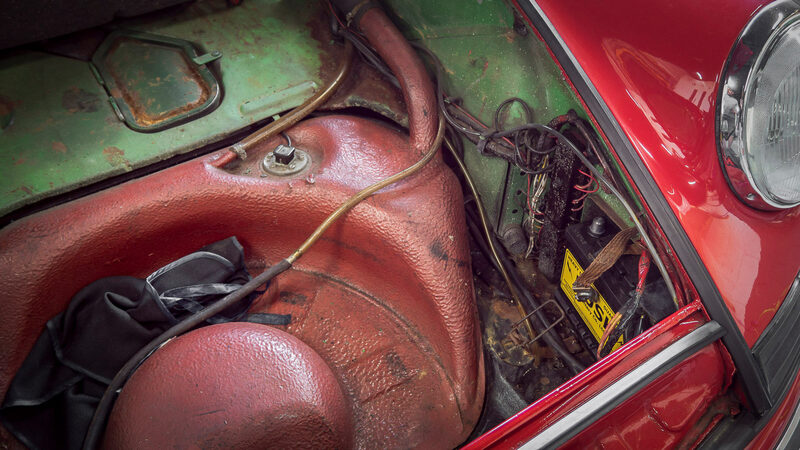 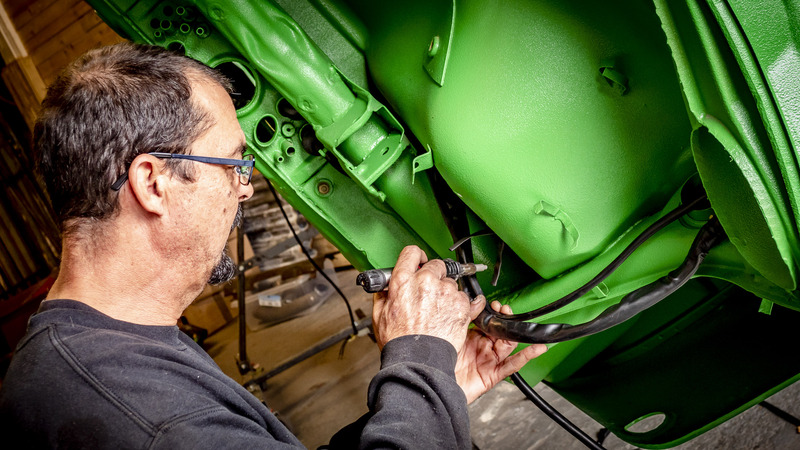 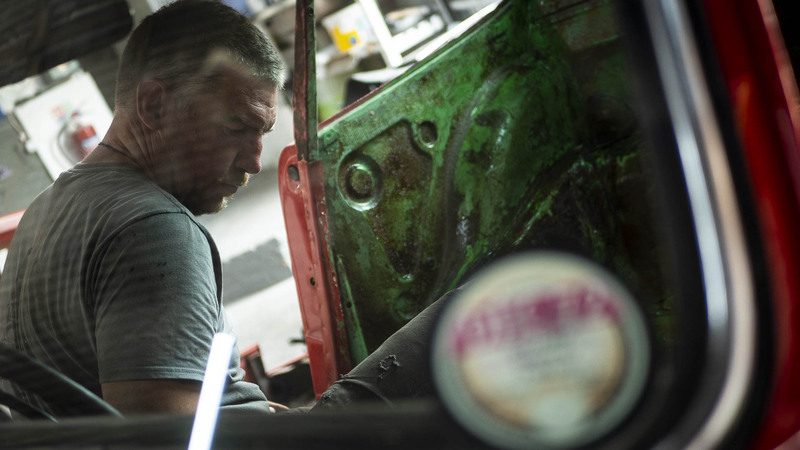 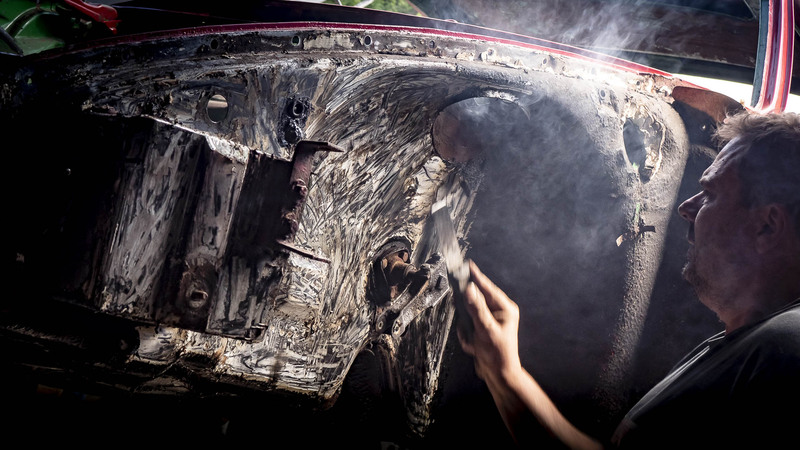 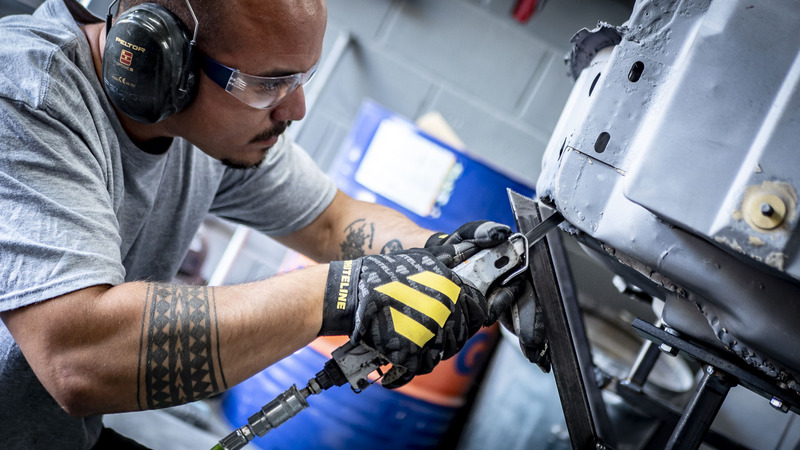 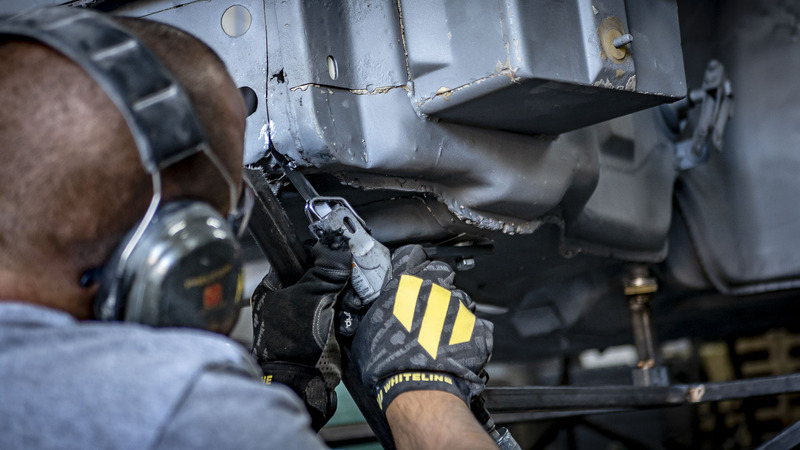 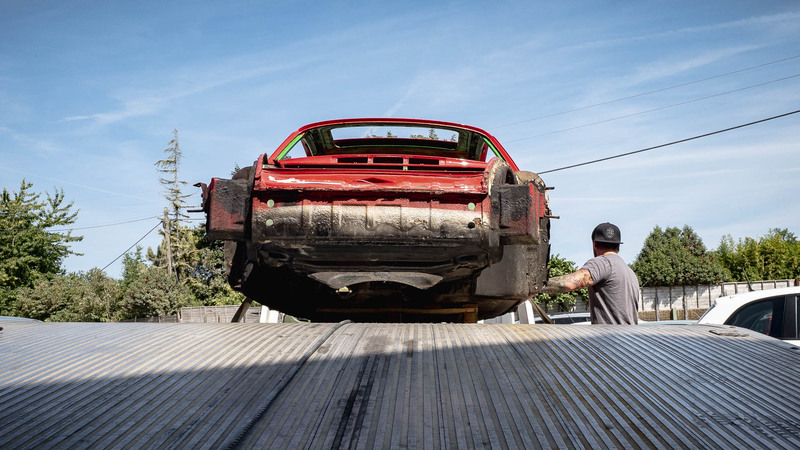 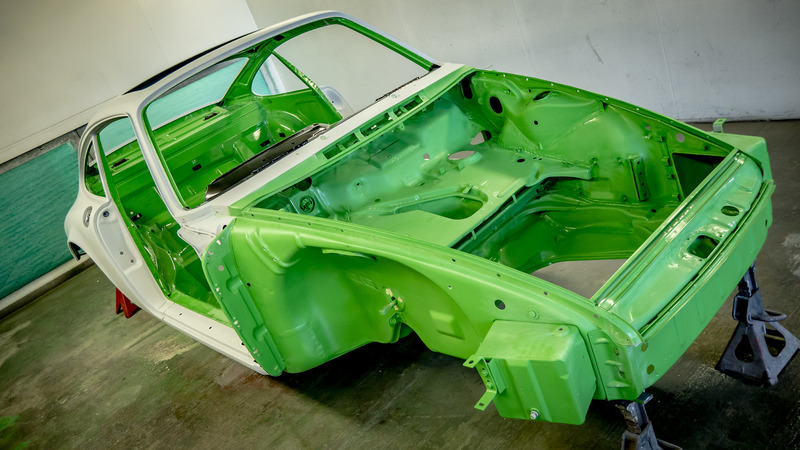 When restoring any car the first place we start is with the body. 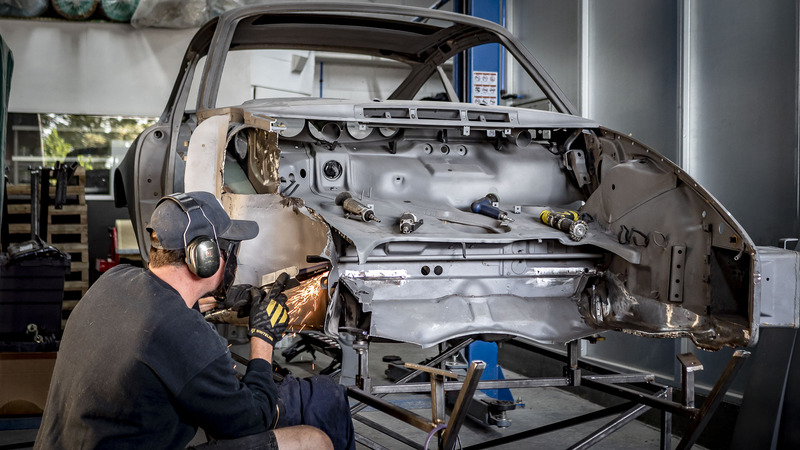 We disassembled every part of the car until it was left with just the body. 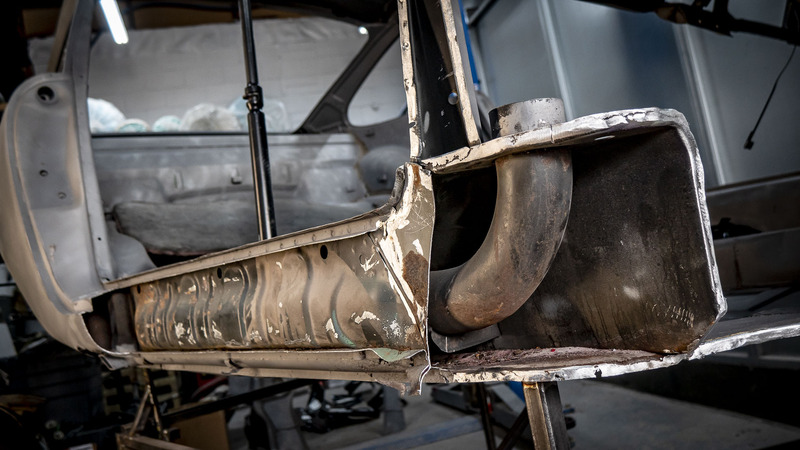 We then sent it to be sandblasted at Just Like New Sandblasters. 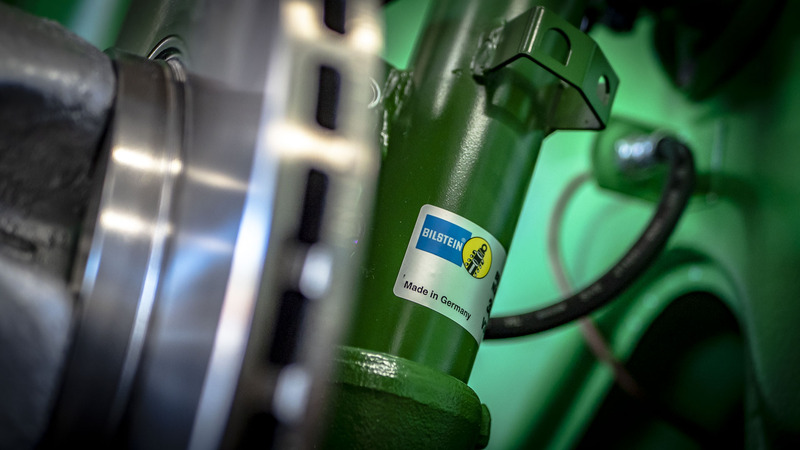 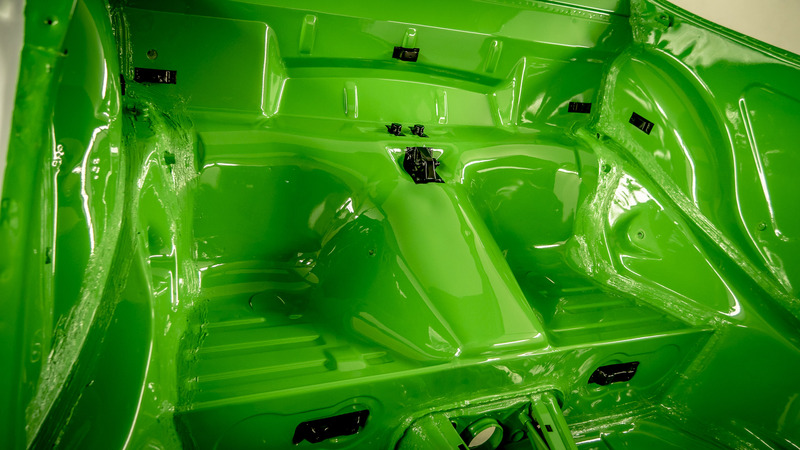 This is the process of roughening and cleaning the surface under pressure so as to remove grease, paint and surface rust. 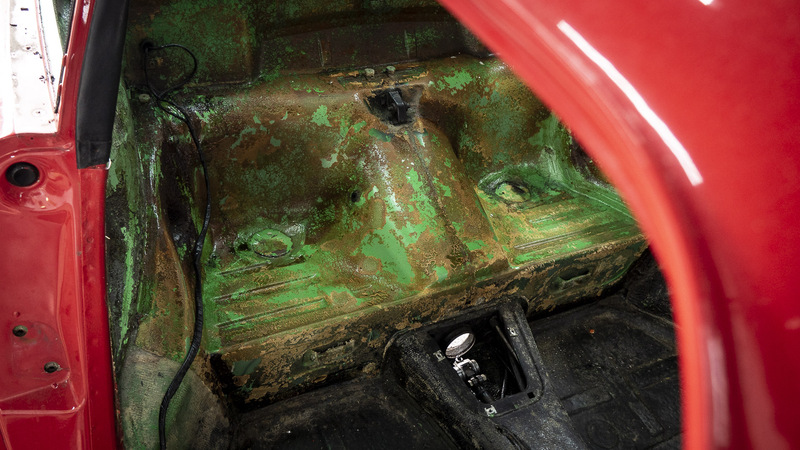 Once finished it allows us to see areas of rust that may have been covered previously and to repair these before moving on to paint. 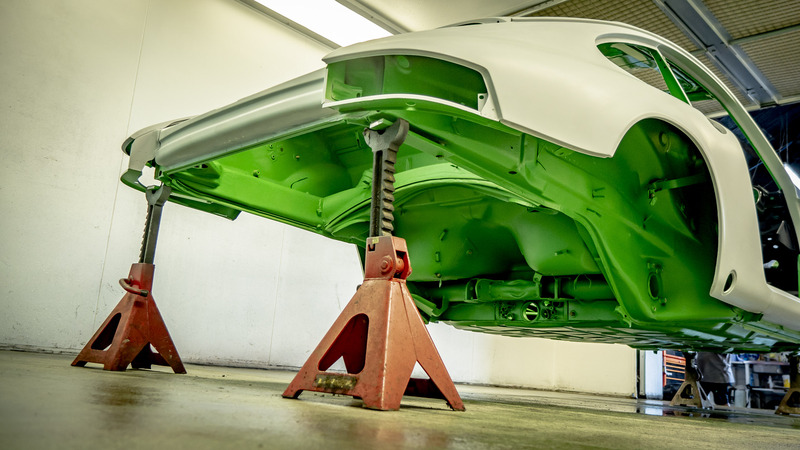 To correct rust spots we will be replacing bad metal with good. 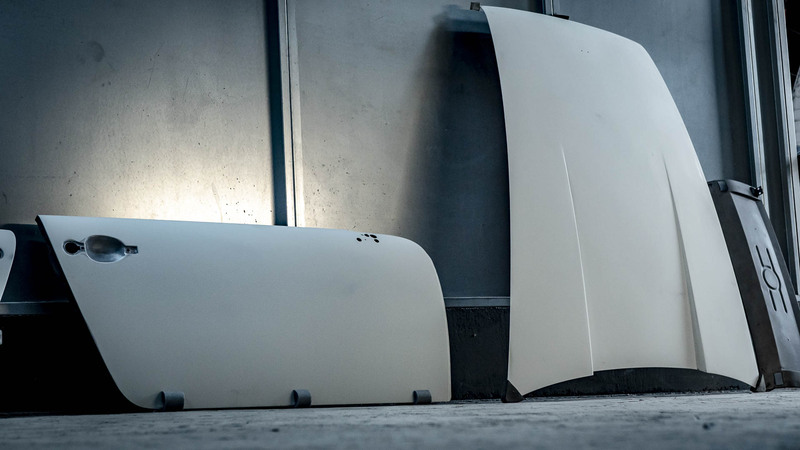 Larger panels such as wings and door skins can be purchased, however smaller panels will need to be fabricated. 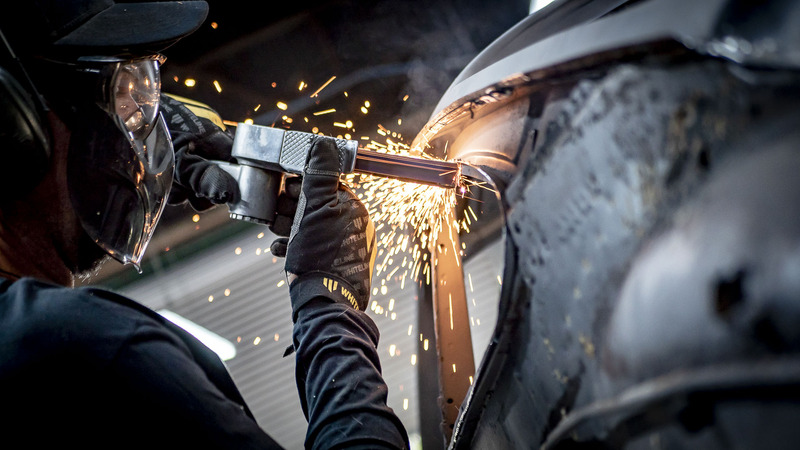 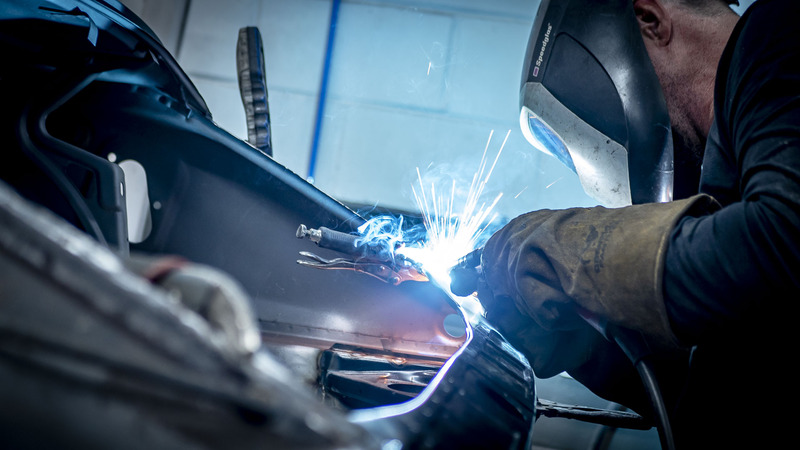 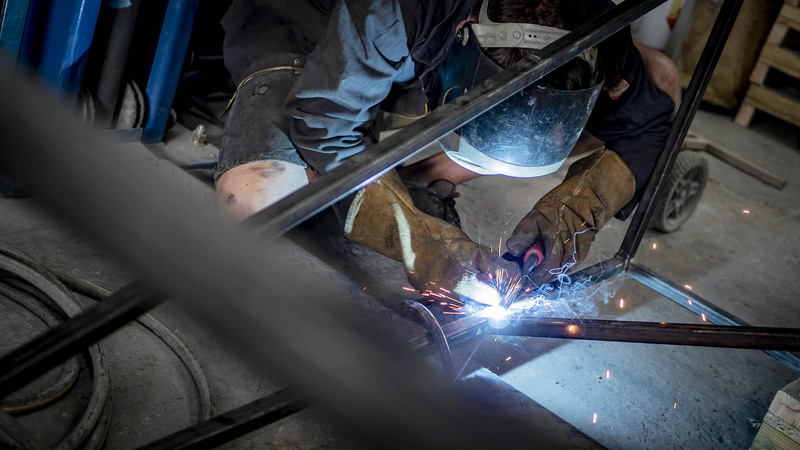 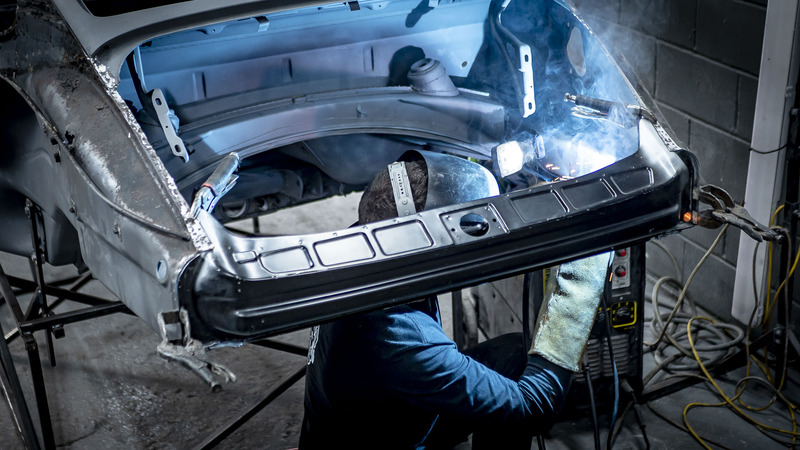 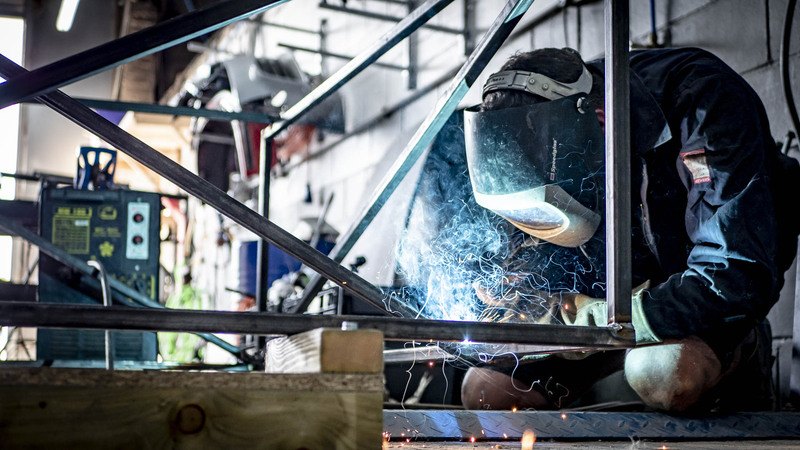 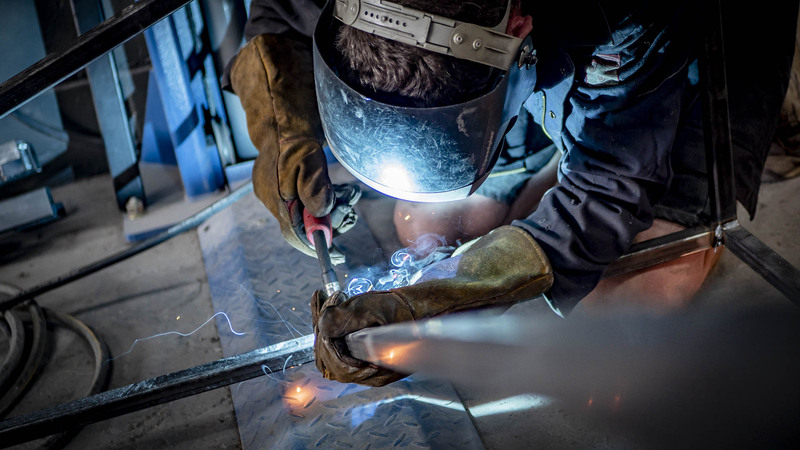 Once a piece is formed it is welded in place for a proper repair. 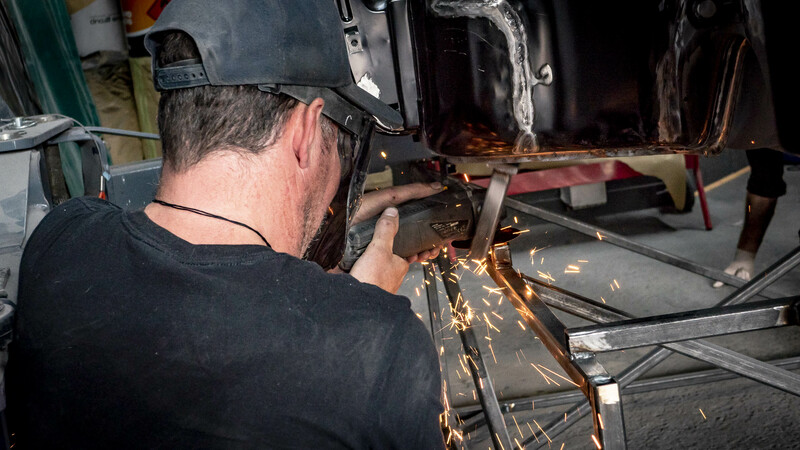 Patch work on this level requires the skill of a talented metal fabricator. 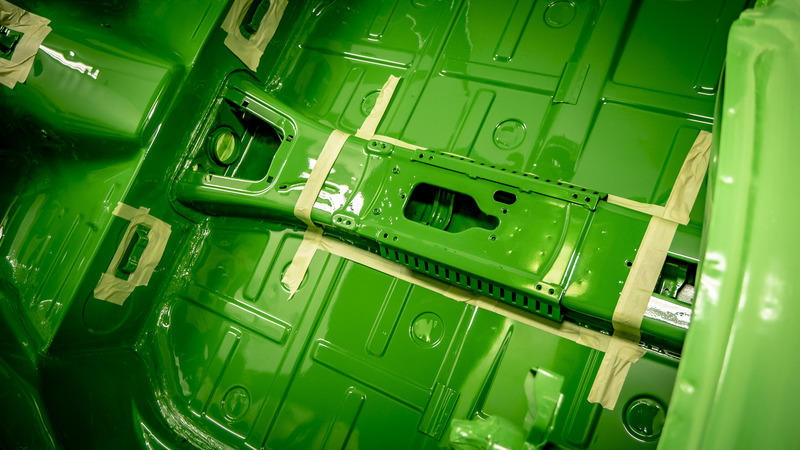 Inner parts of the panels are also treated for rust as well as injecting wax oil to prevent any future rust or corrosion. 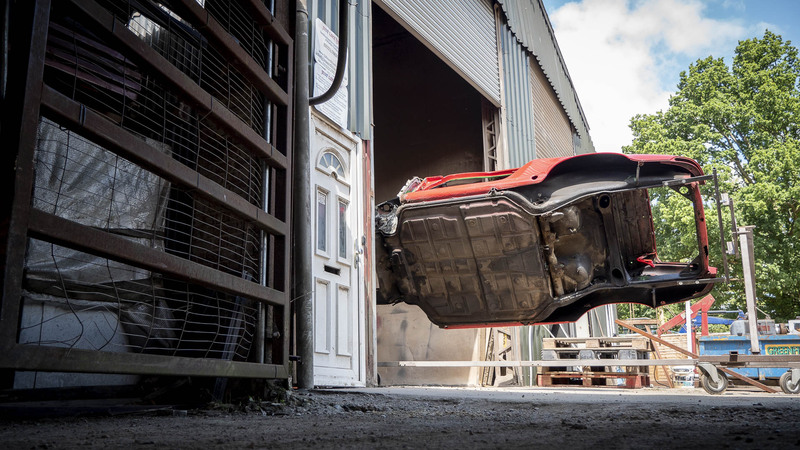 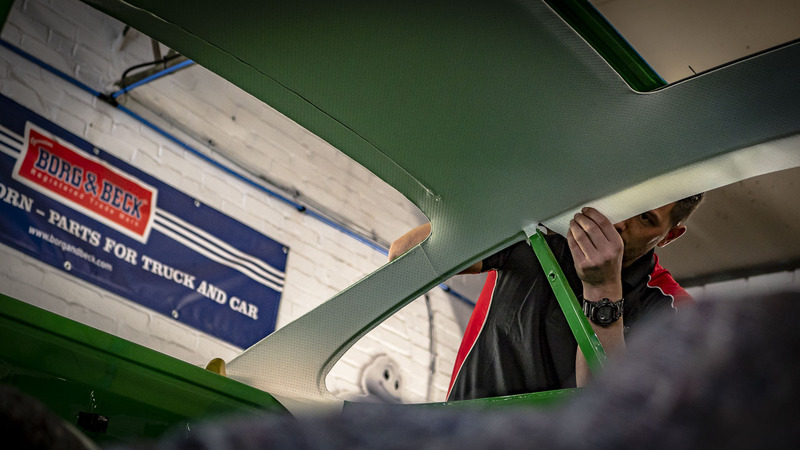 With the car back at the bodyshop we assessed the damage and drew up a list of the panels that will need to be replaced and there will be a lot. 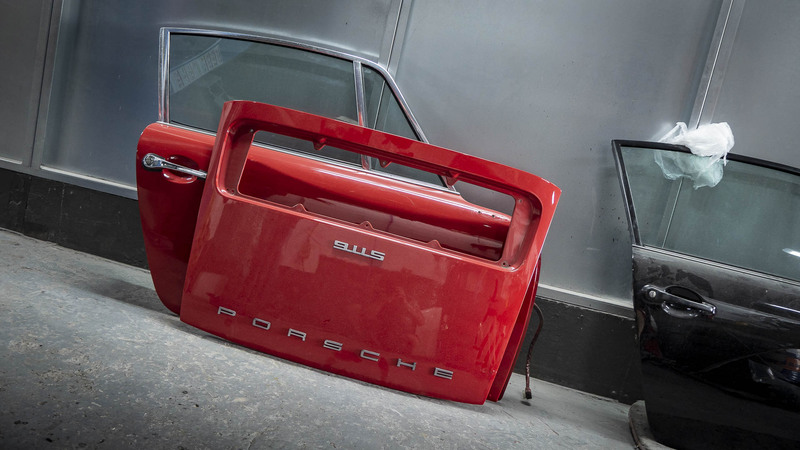 AL has fabricated a box section jig to mount the 911S to, to keep everything aligned when replacing the panels. 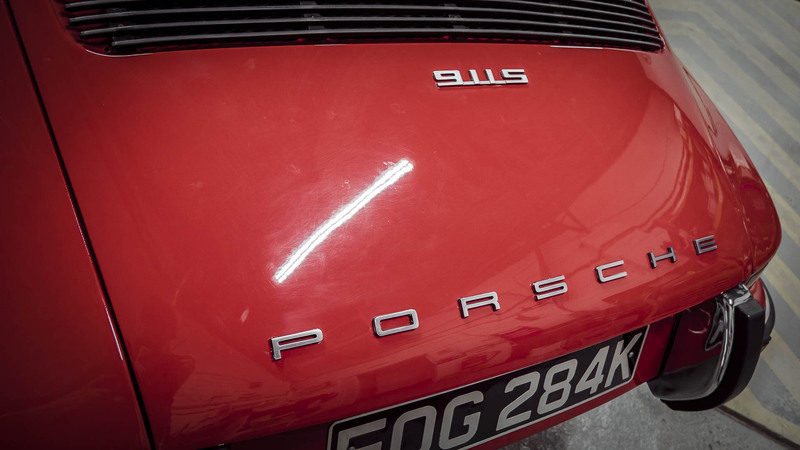 Thanks to Porsche Tonbridge for supplying the genuine replacement panels. 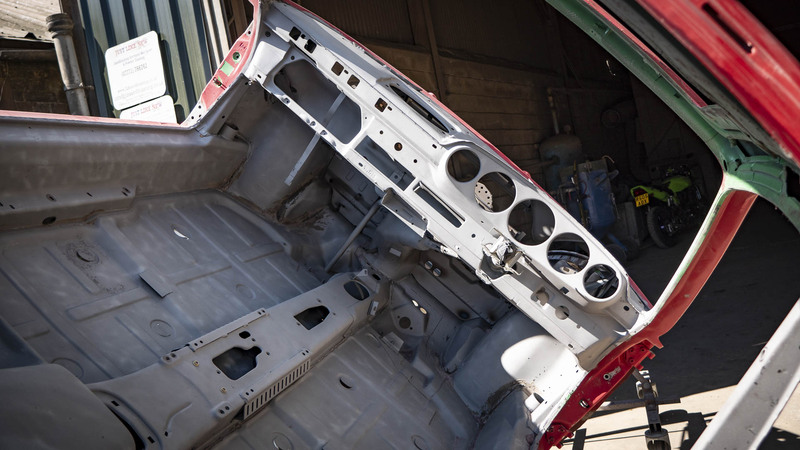 AL and Ash have been cutting out the old panels that have needed to be replaced with surgical precision. 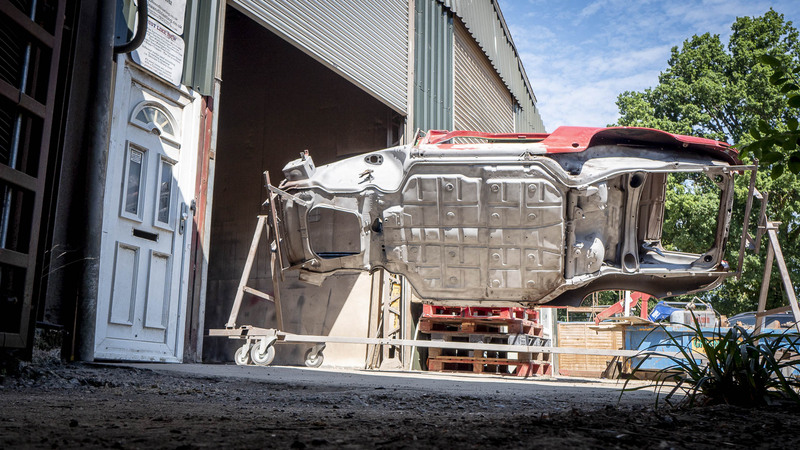 It really is like dissecting a car! 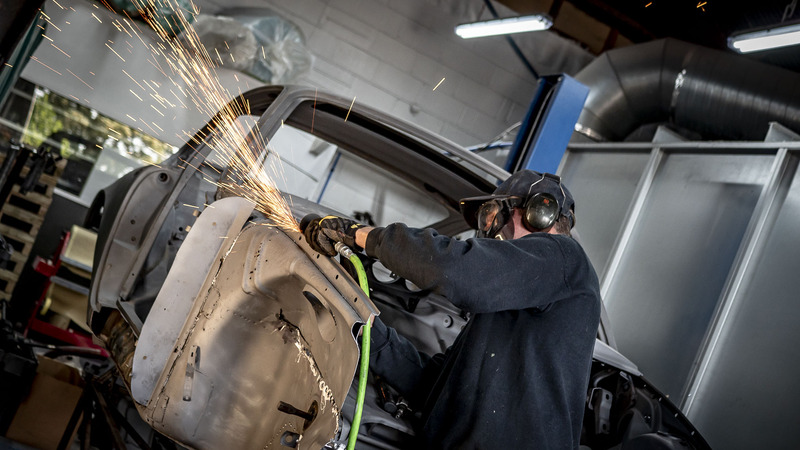 With all the old panels cut out and removed, AL has started to weld in the replacement ones, starting at the back of the car. 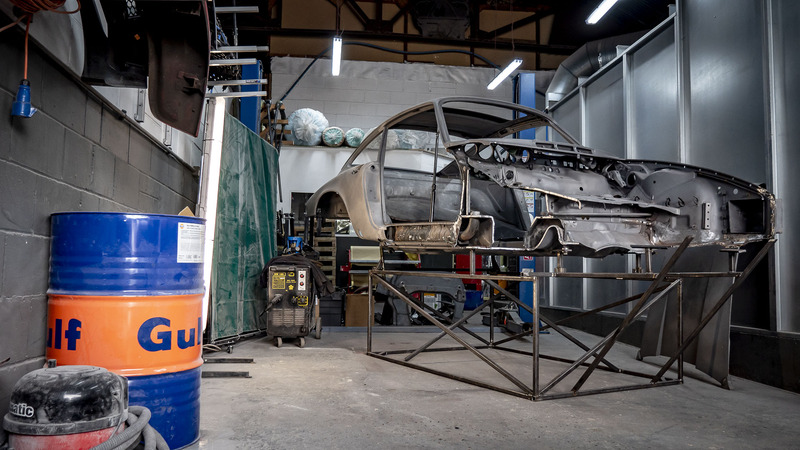 Now all the fabrication has finished the car was placed on a rotating spit, this is helpful to get to those hard to reach areas. 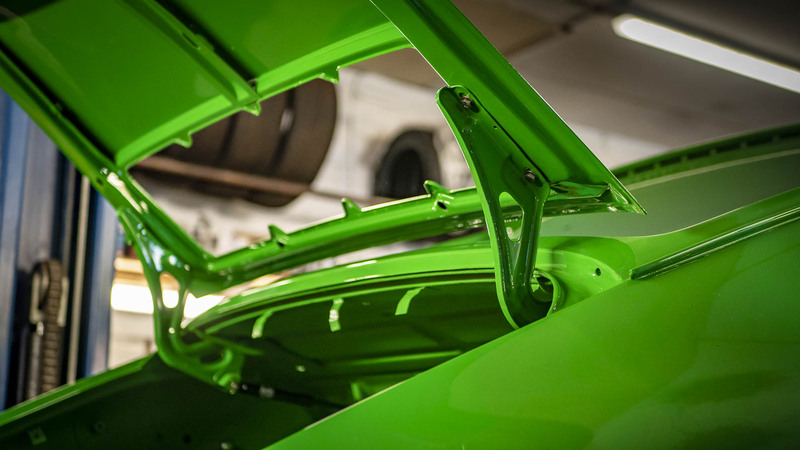 Rotating the car allows easy access to all parts of the body and makes reaching the undercarriage much easier. 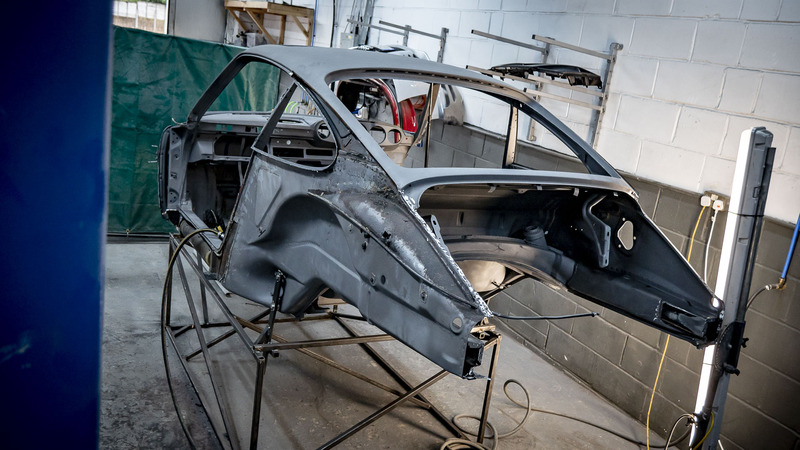 Now the metal work has been completed we need to get it ready and prepped for paint! 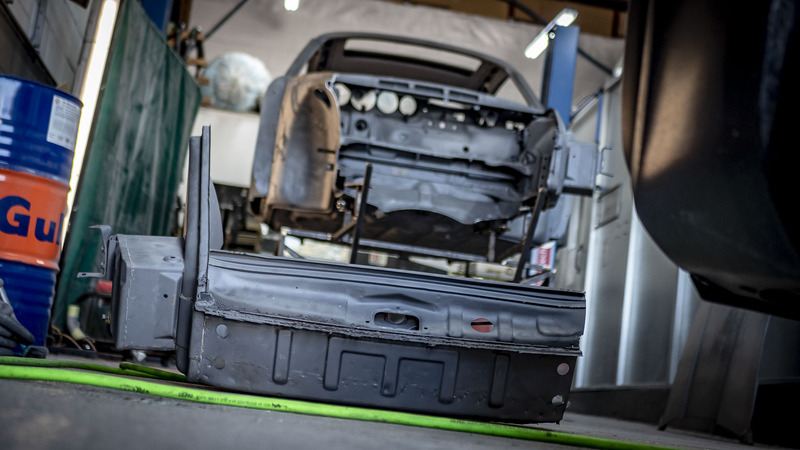 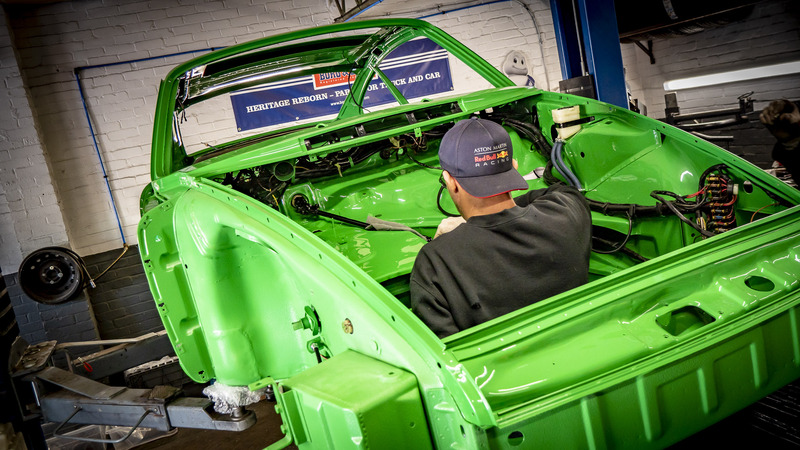 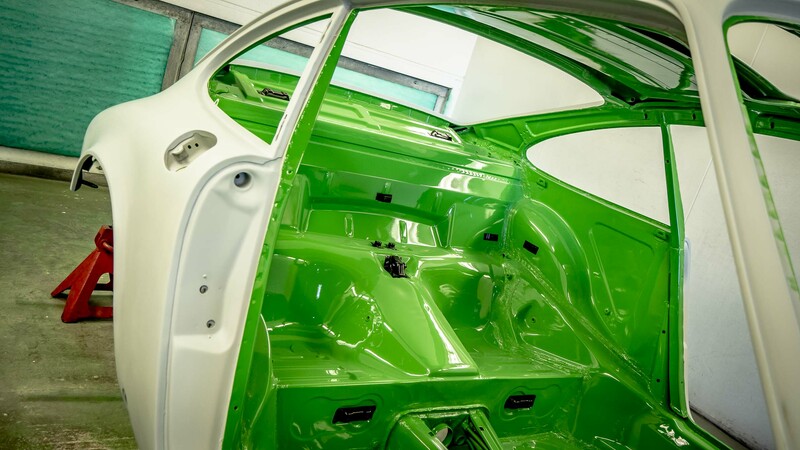 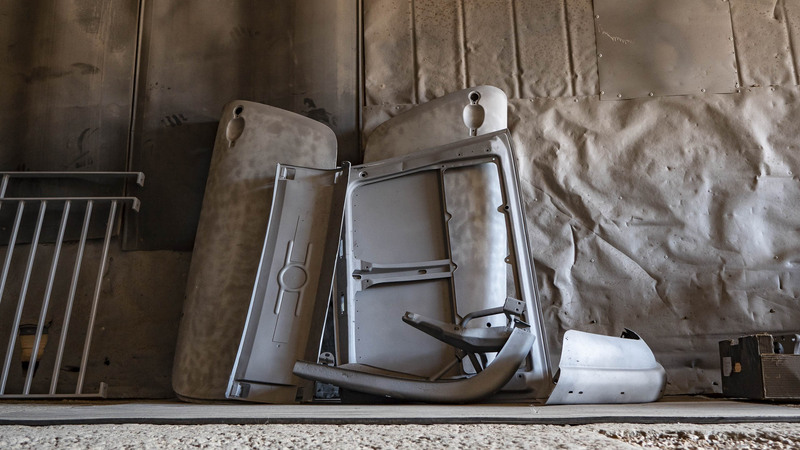 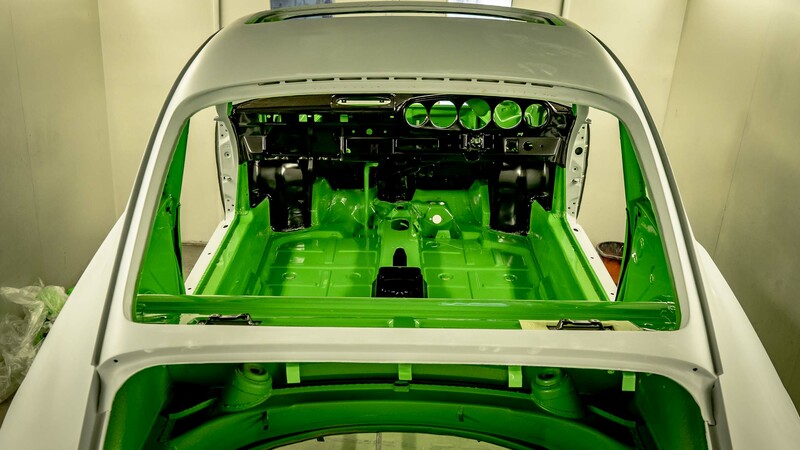 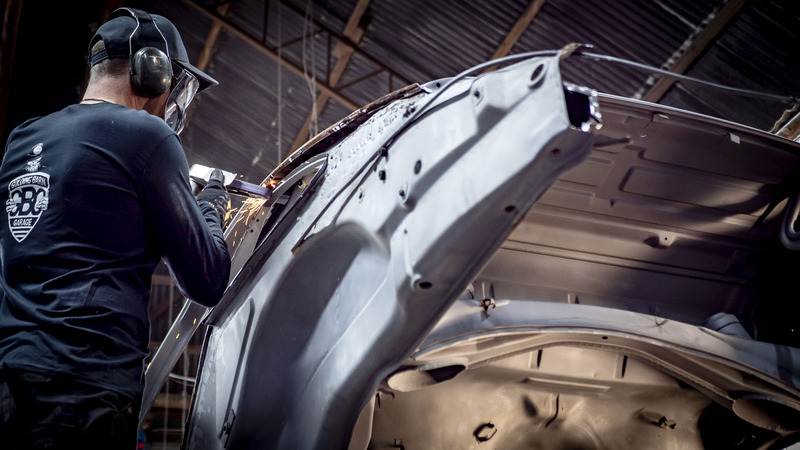 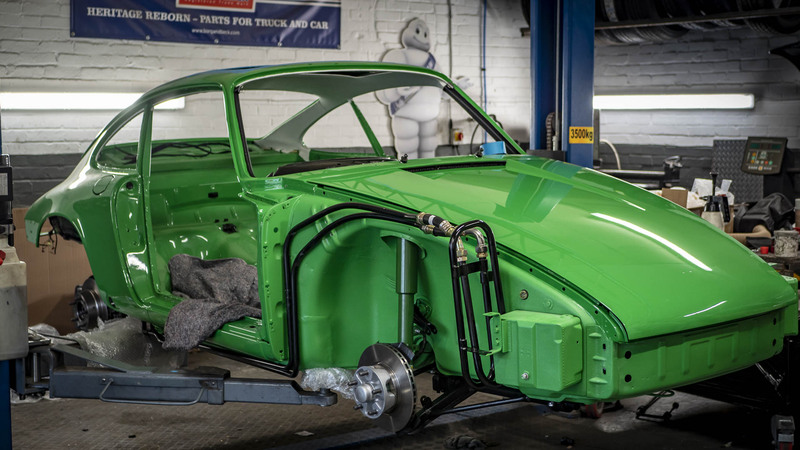 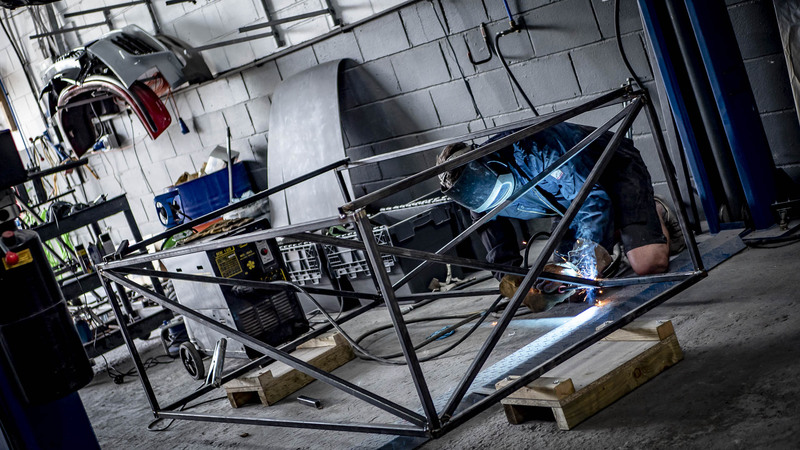 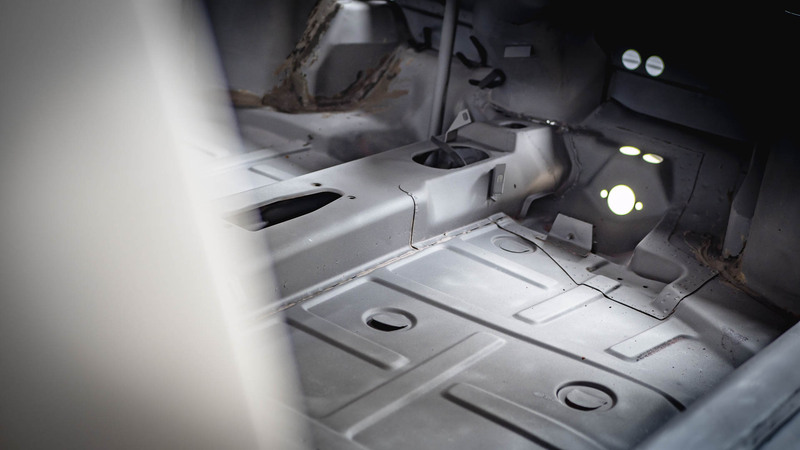 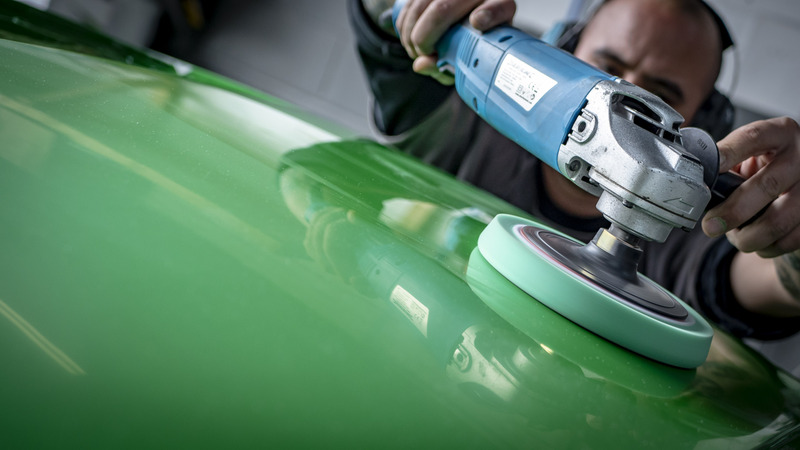 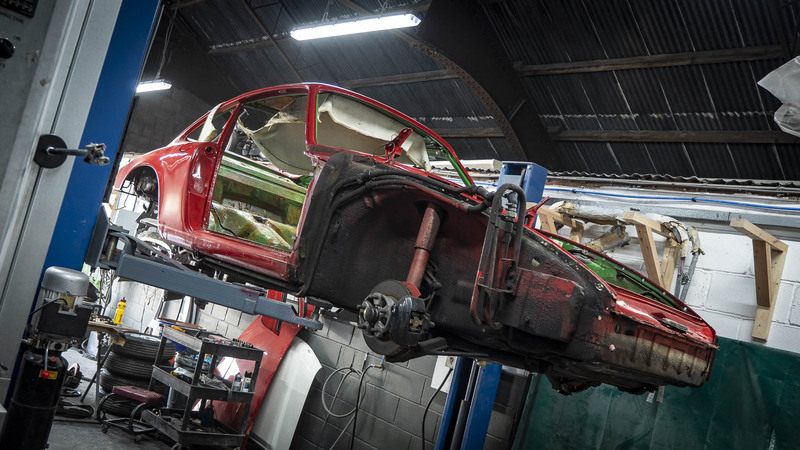 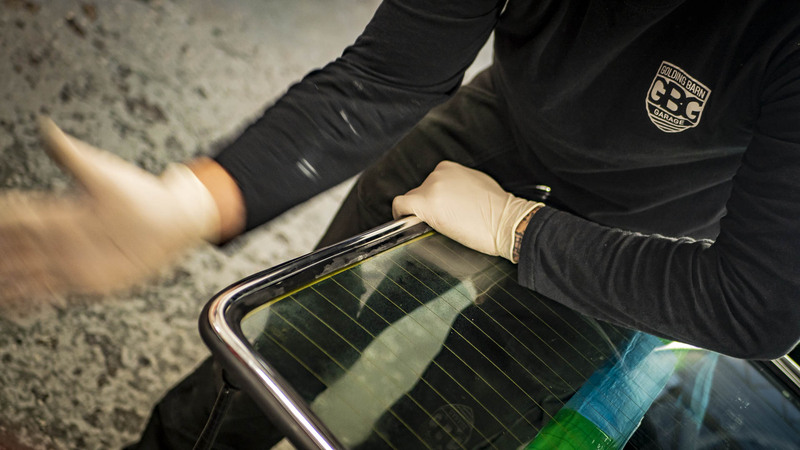 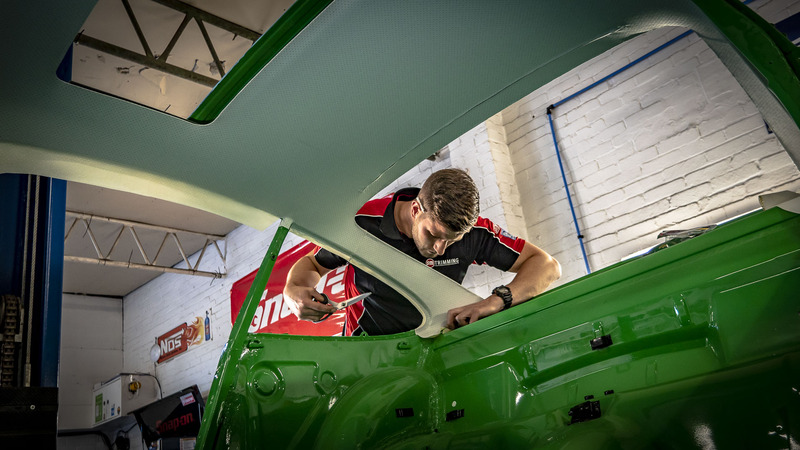 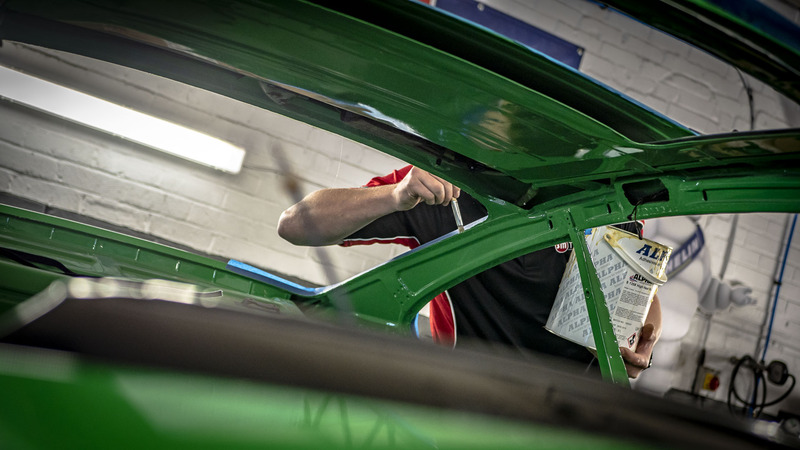 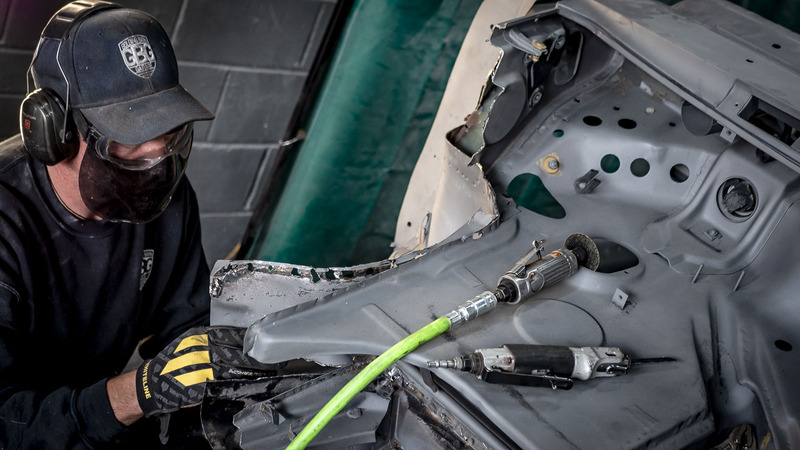 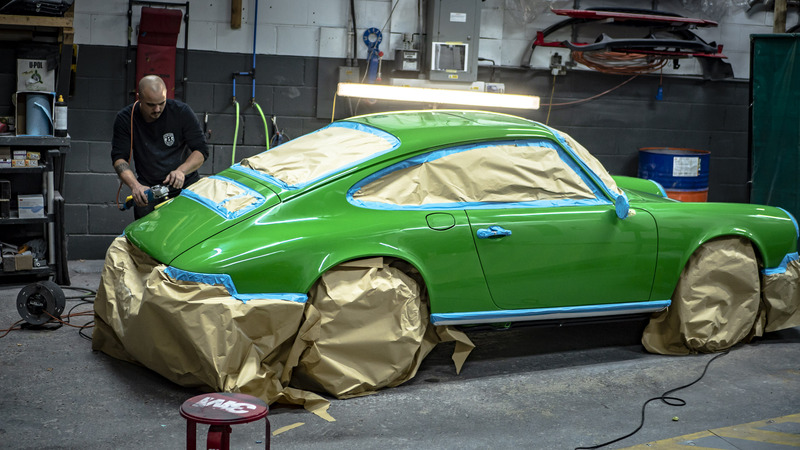 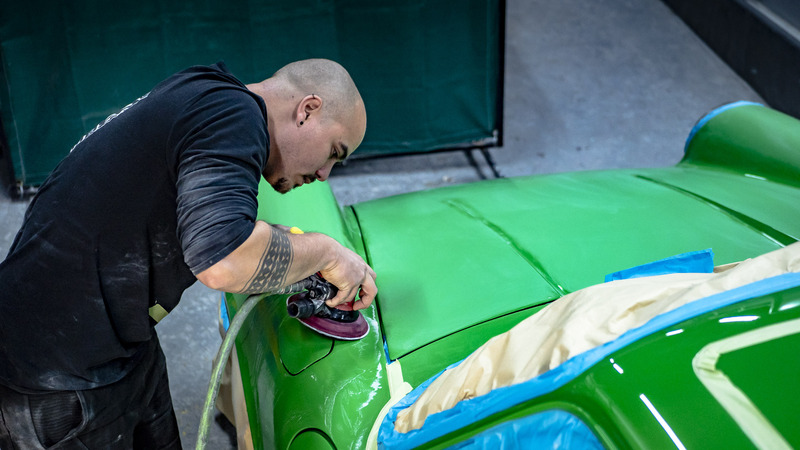 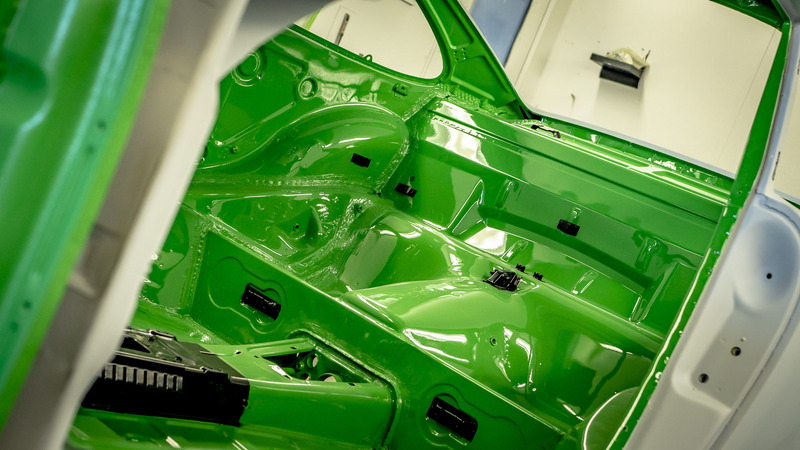 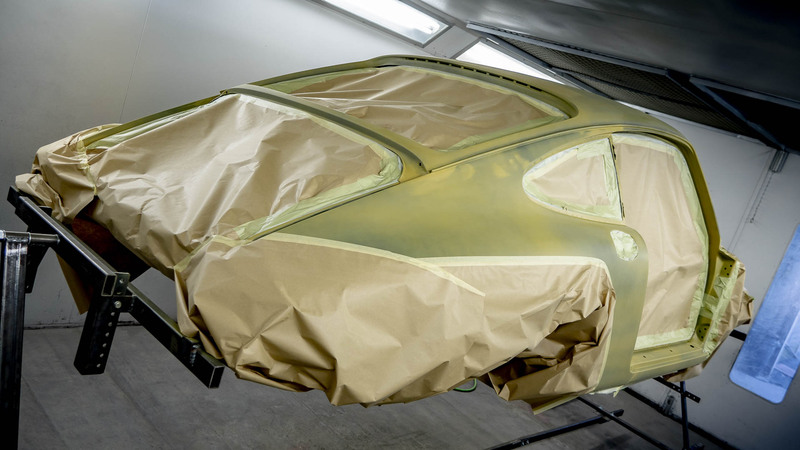 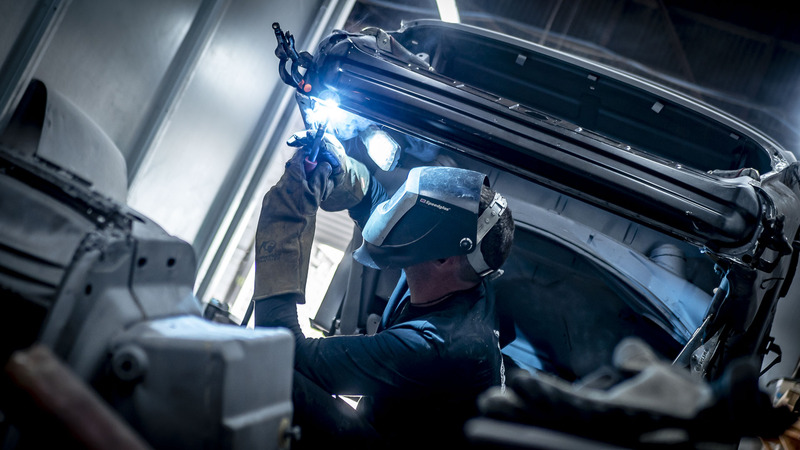 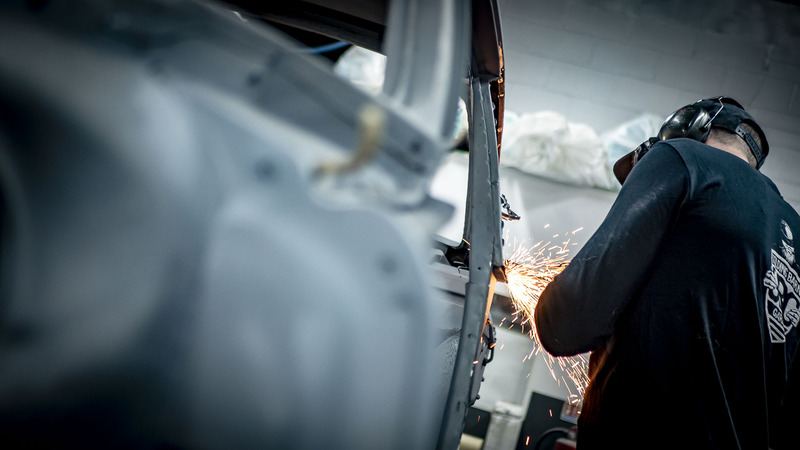 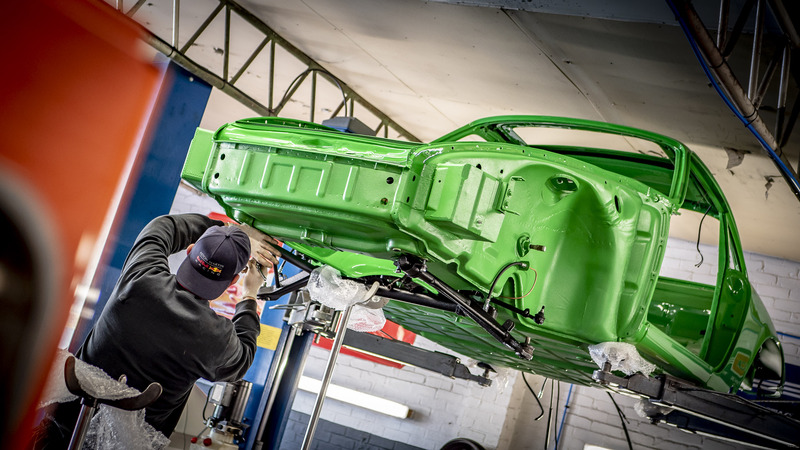 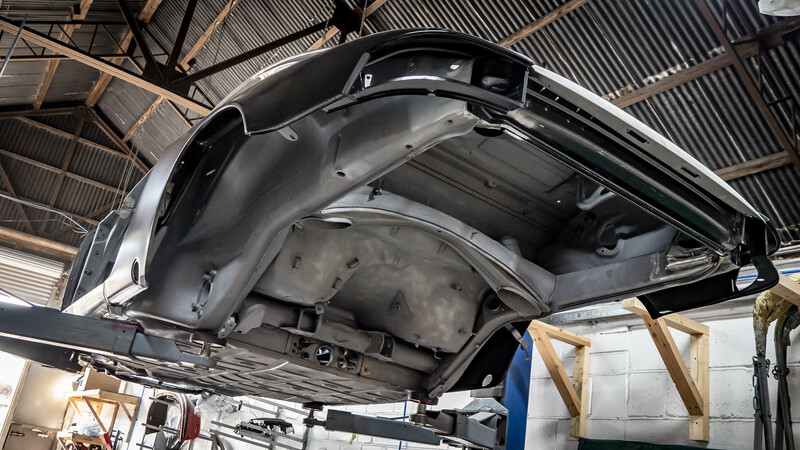 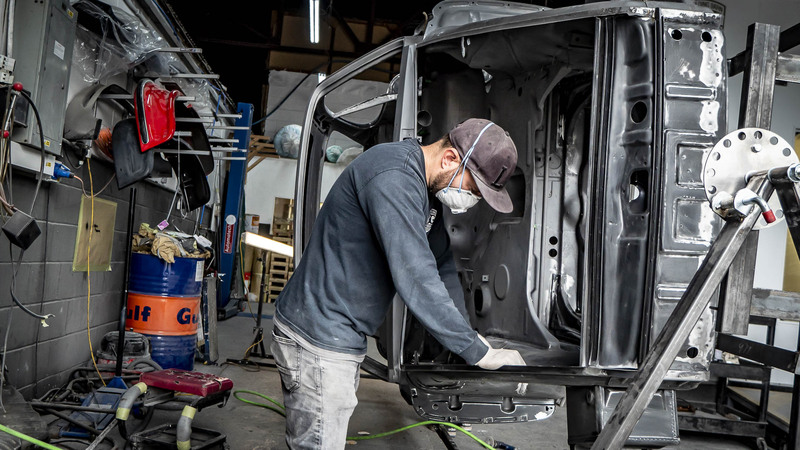 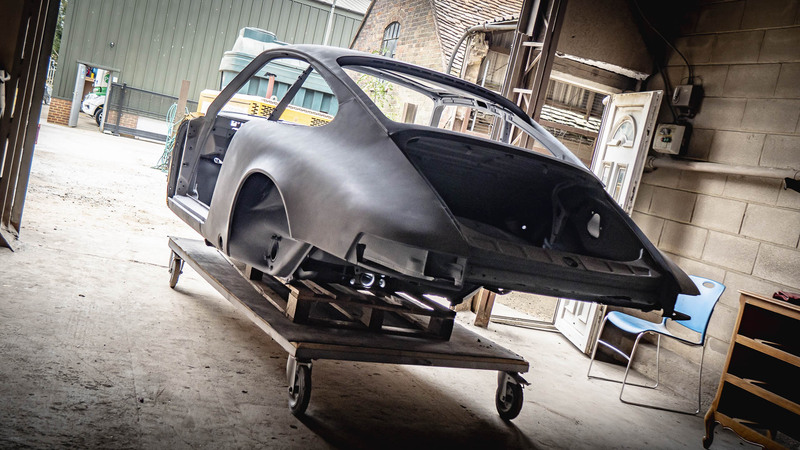 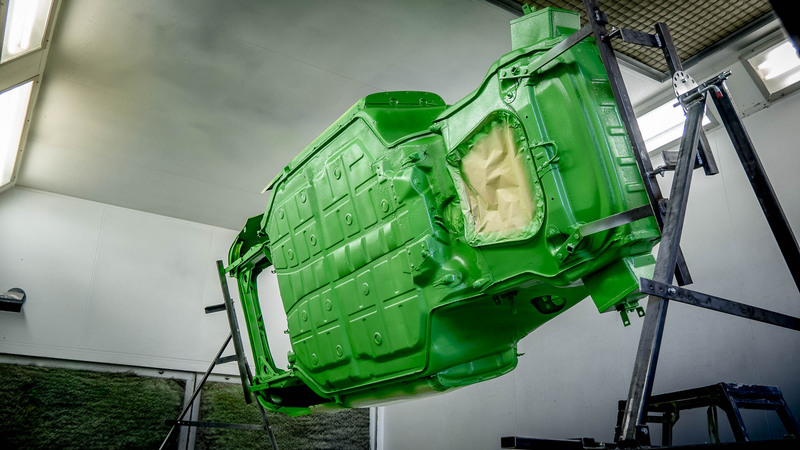 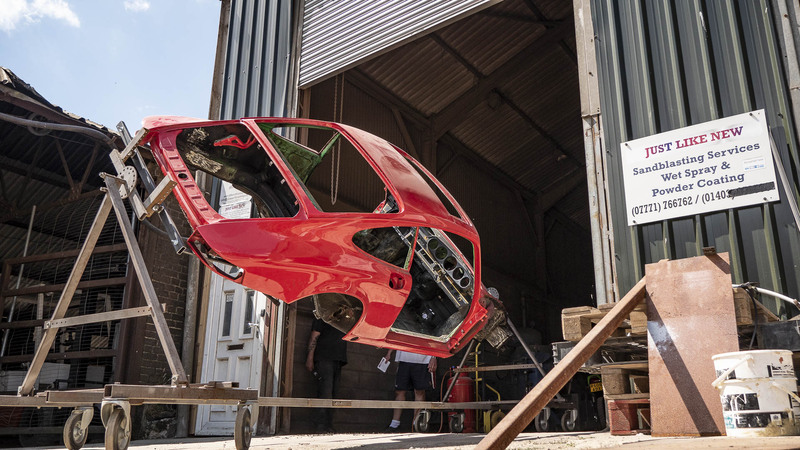 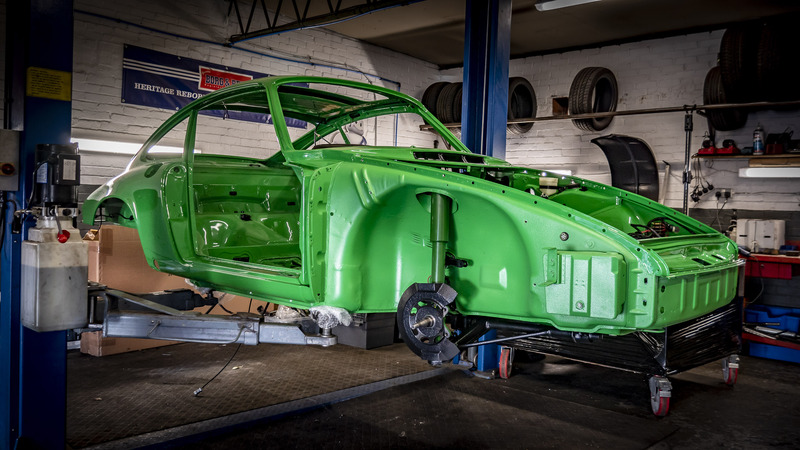 All panels will be prepped – inside and out, the whole car will then be etch primed. 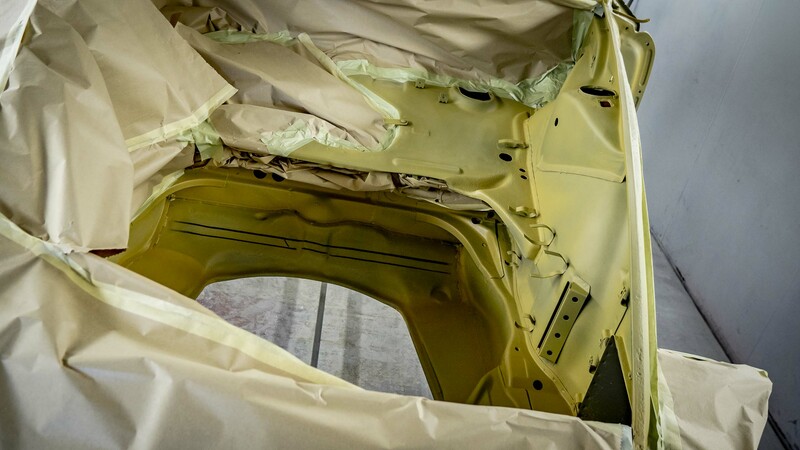 This is an acid etch which is sprayed on so the paint clings to the metal, giving the car a yellow tinge. 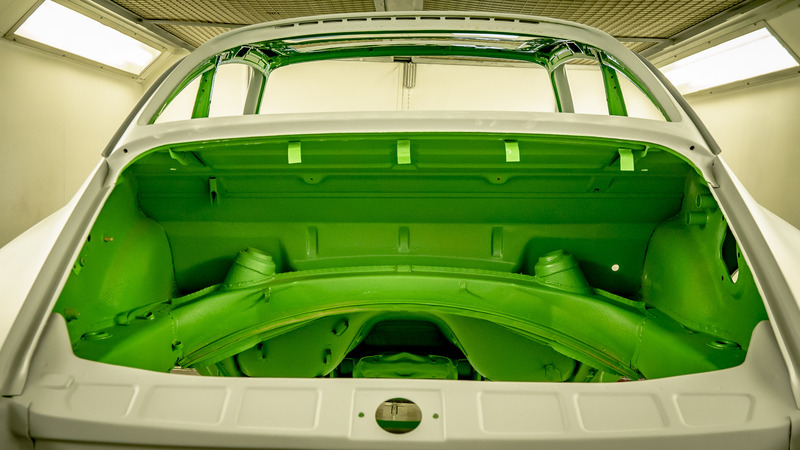 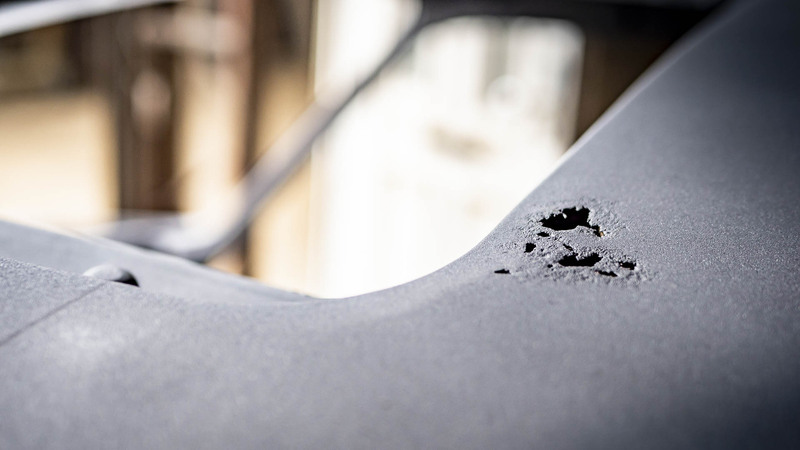 Some panels may require a spray filler to fill any imperfections – Below you can see the bonnet and door after spray filler. 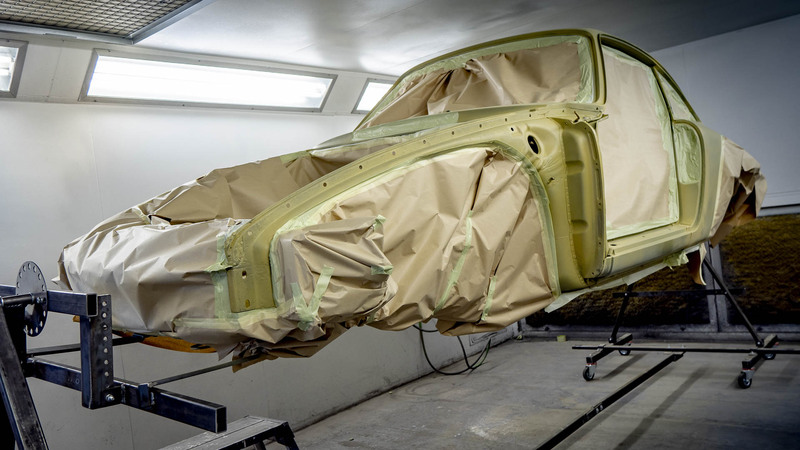 From here those panels will be block sanded – This is the process used to level the surface prior to paint. 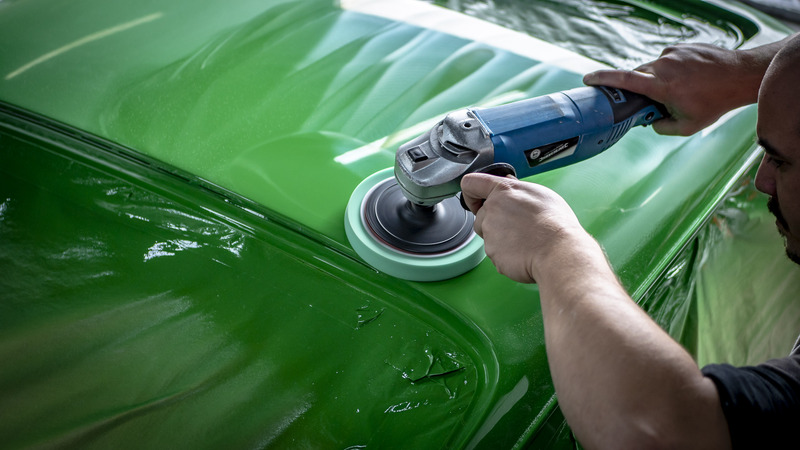 This is performed by hand and can take days or weeks to achieve a perfect surface. 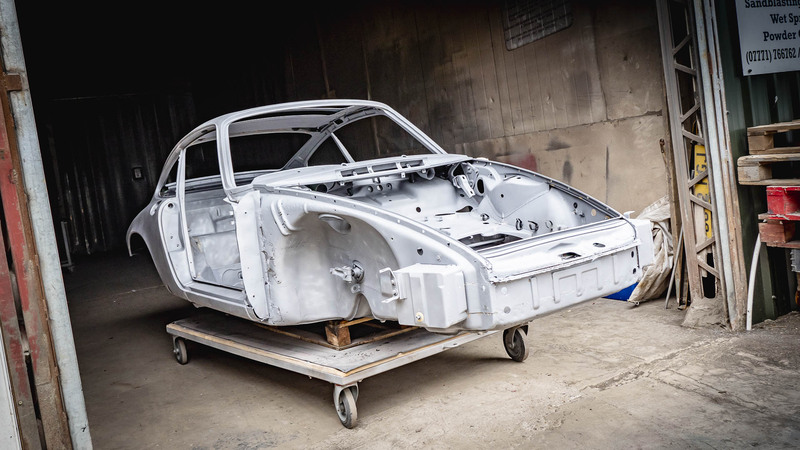 The Porsche is now ready for primer. 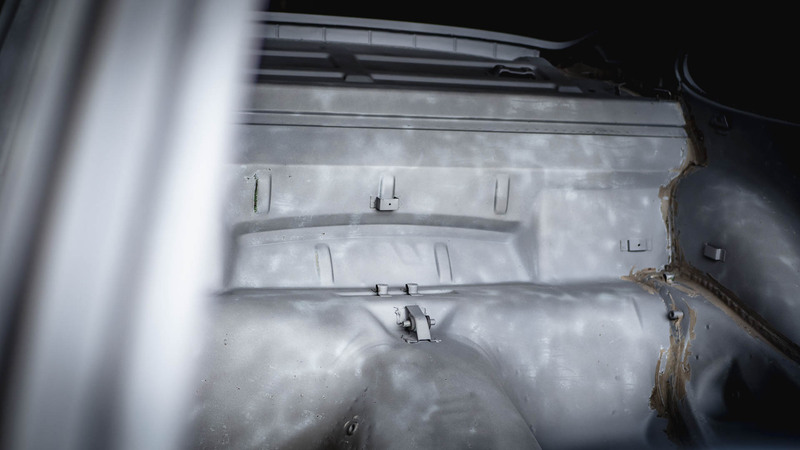 The entire car was sprayed with a primer coat. 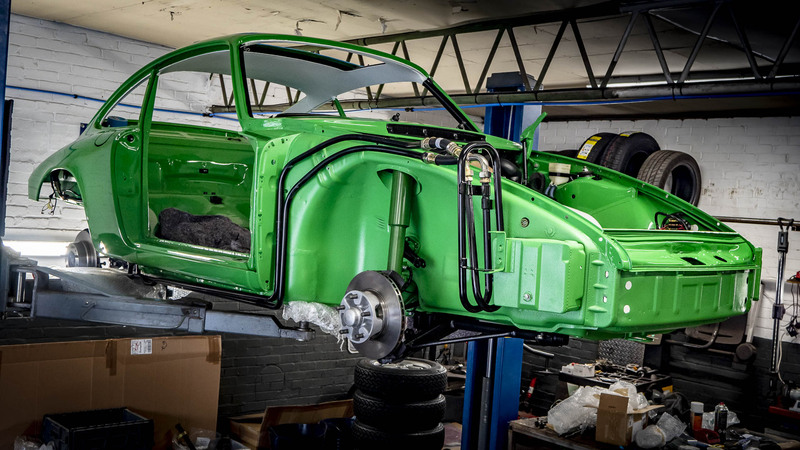 We then raptured the underside of the Porsche in its original Viper green. 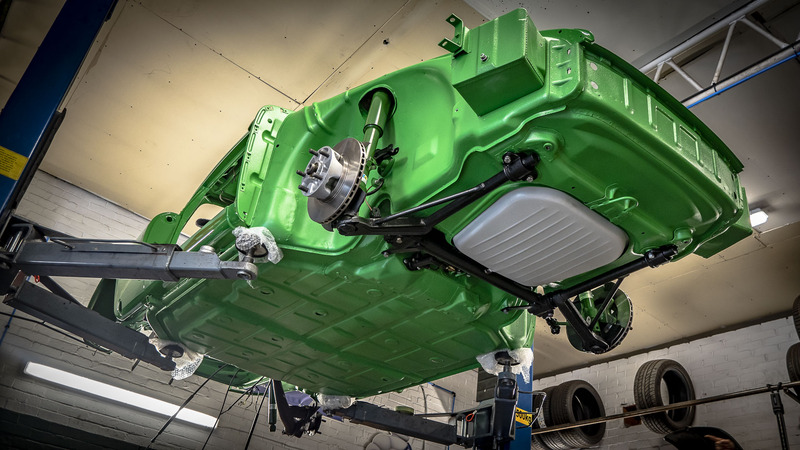 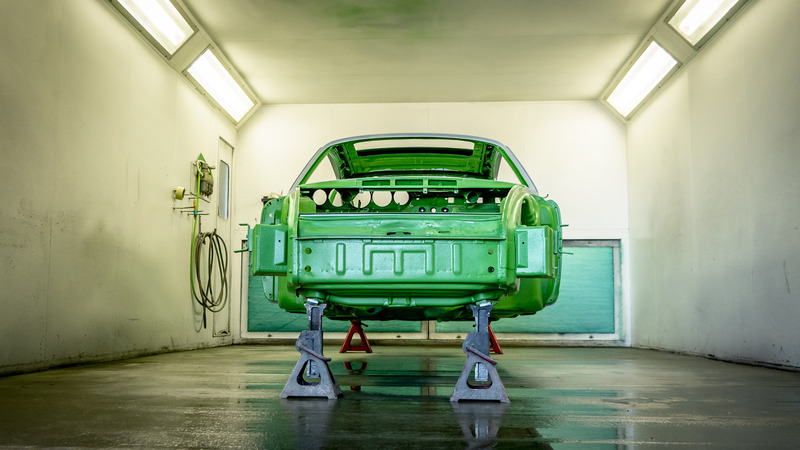 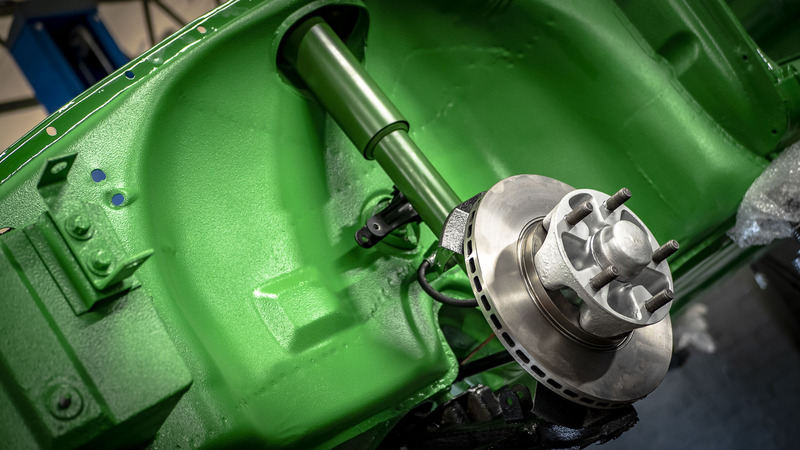 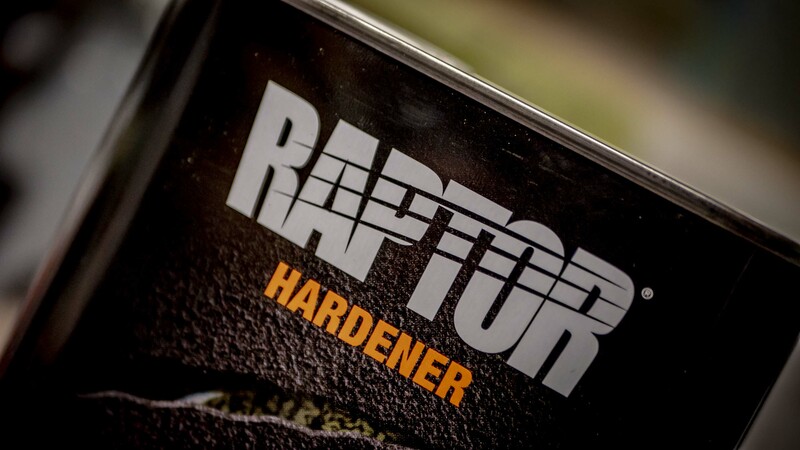 All the Green which has a dull matte finish is U-Pol Raptor- Raptor is a super tough and durable coating which protects against rust, damp , corrosion and extreme temperatures. 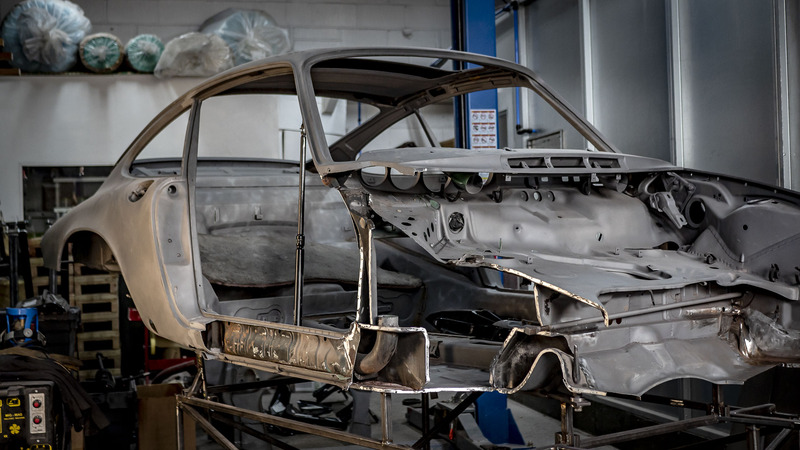 If this car was destined to never be driven this process isn’t necessary but having this extra coating gives it extra durability. 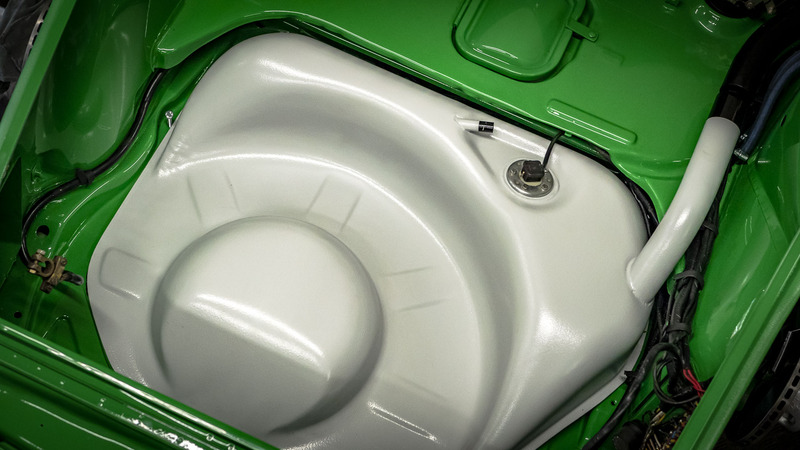 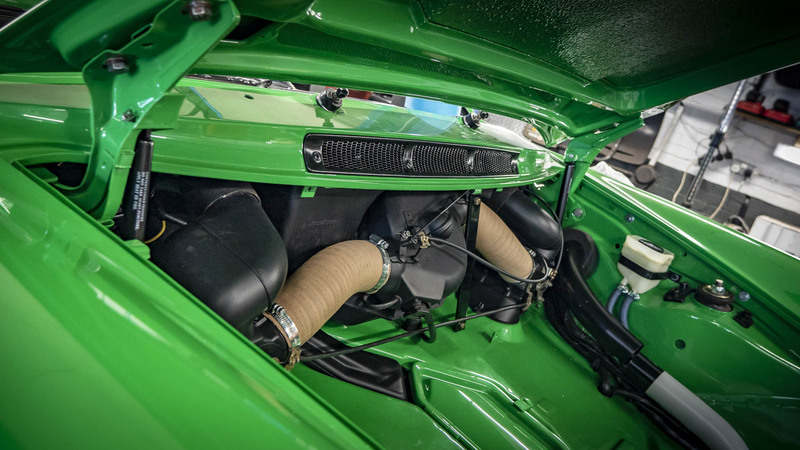 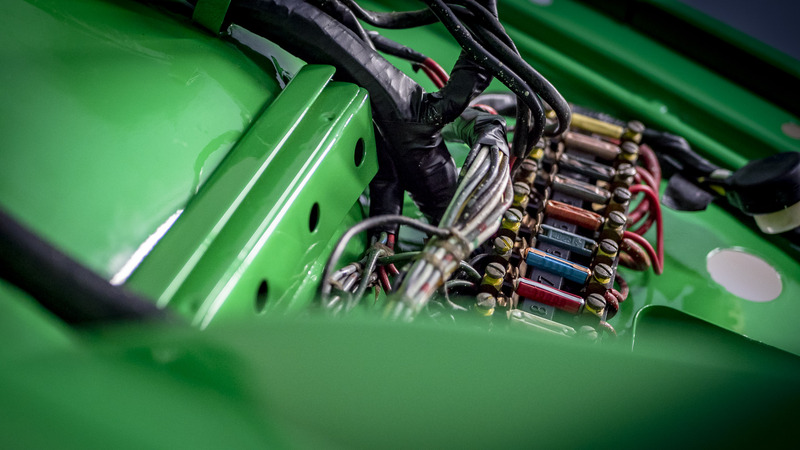 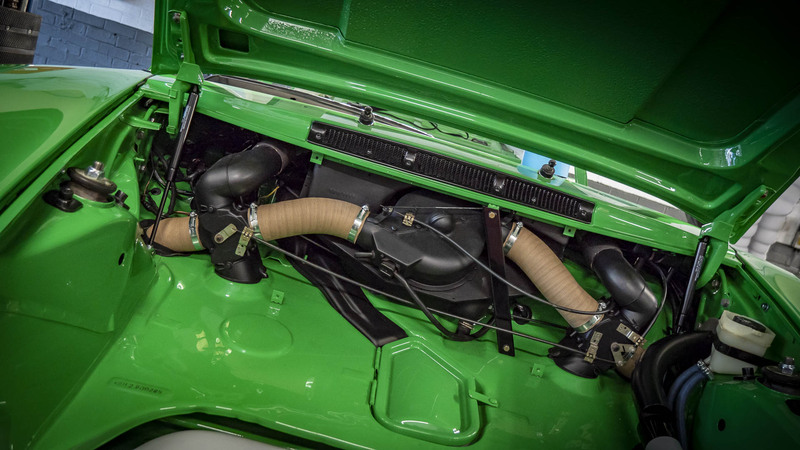 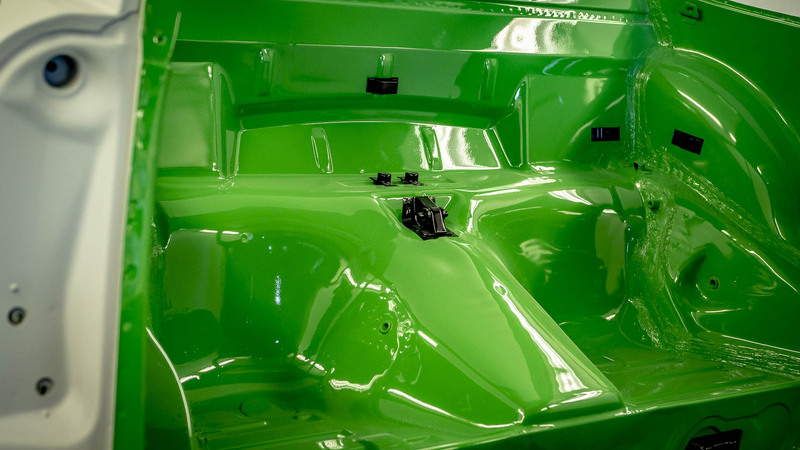 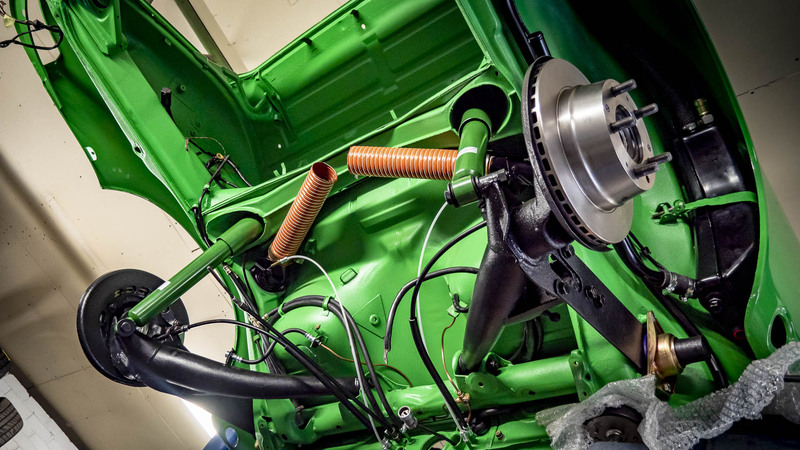 The inside of the car was completed also in its original viper green but in a gloss finish. 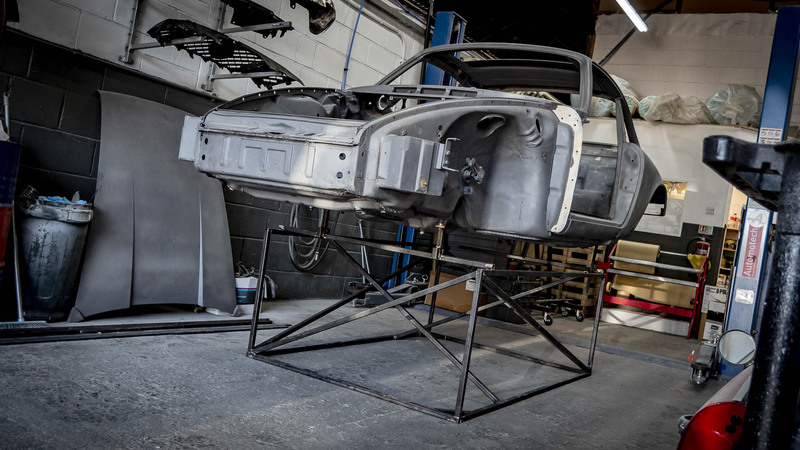 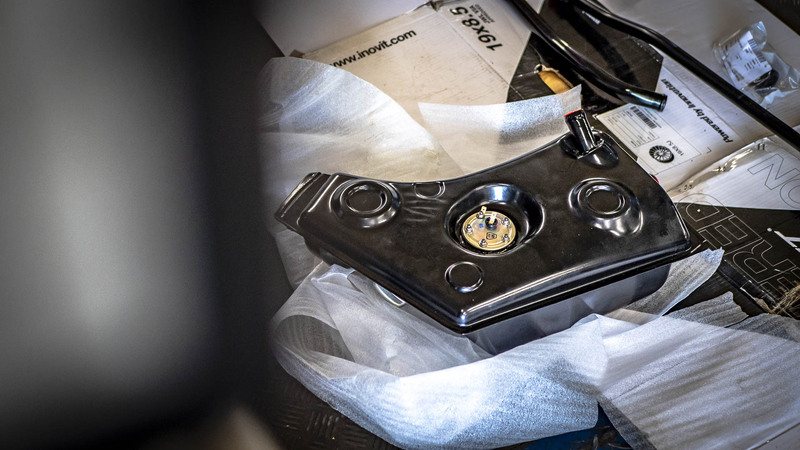 All the brackets and any protruding parts that will be seen once the interior is fitted were masked up and painted in a satin black. 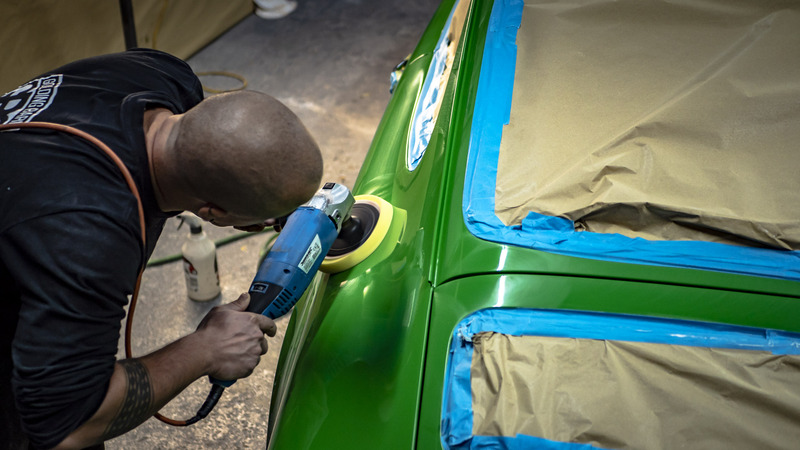 A good Paint job requires hours of preparation and skilled craftsman. 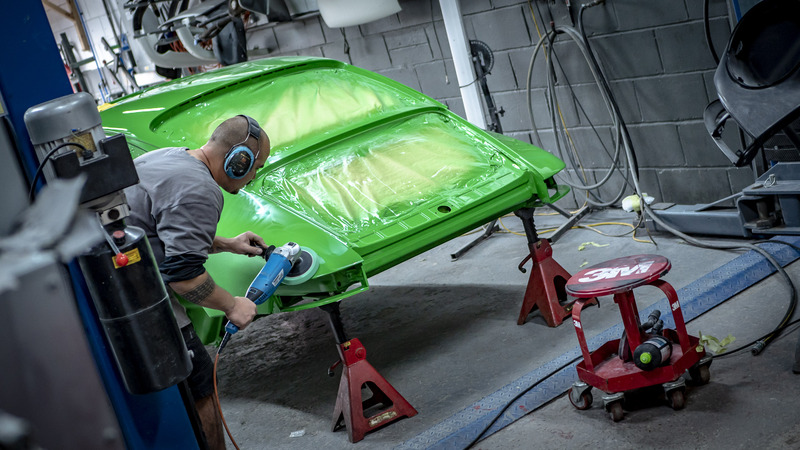 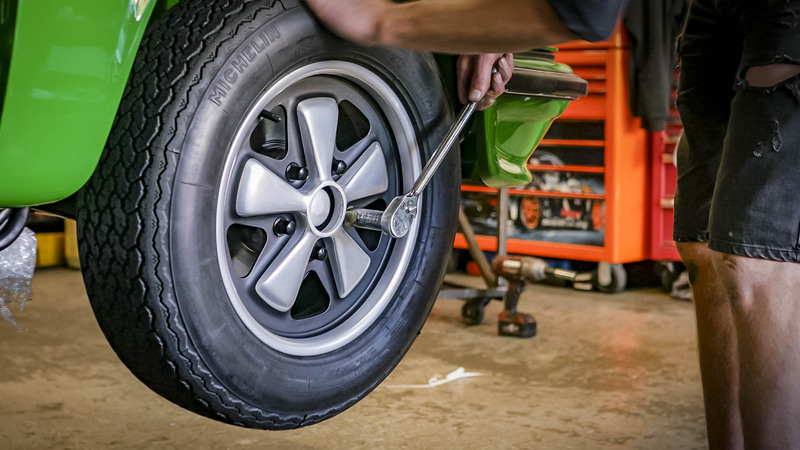 The prep is crucial in getting an excellent finish and no step can be rushed. 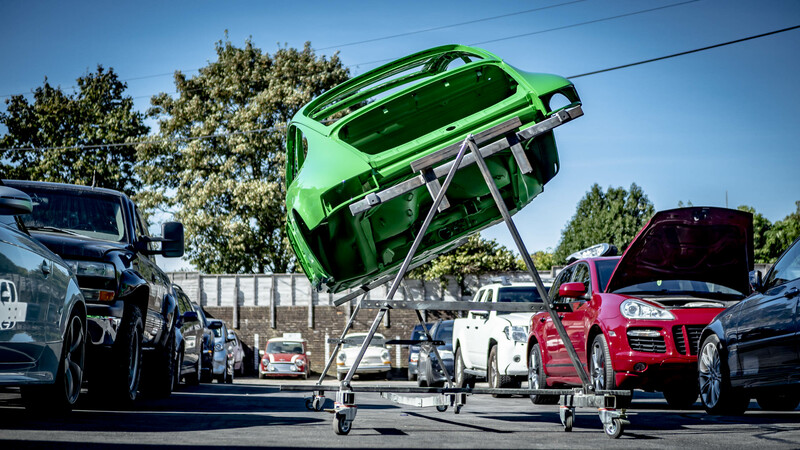 Check out our time lapses. 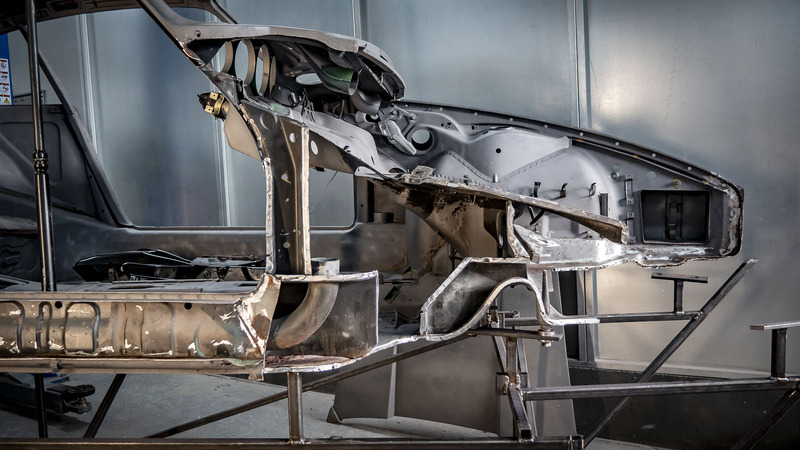 The shell was then flattened and polished to a mirror finish. 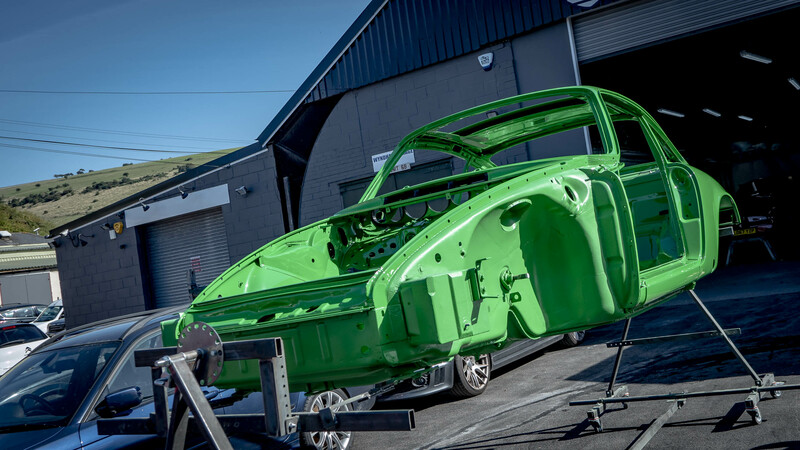 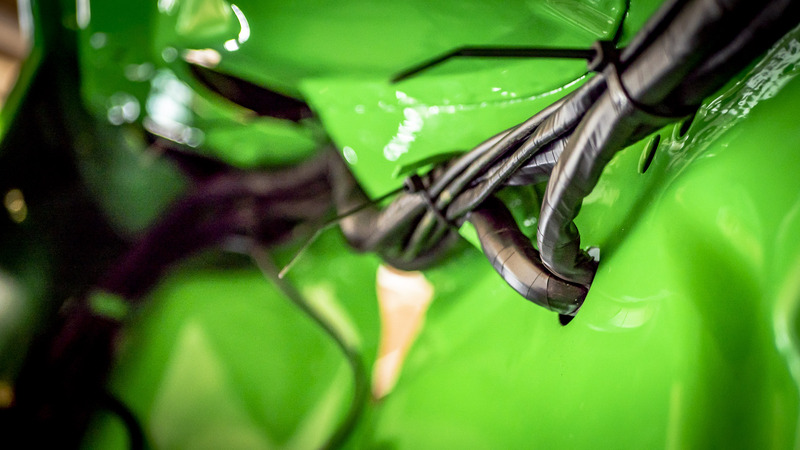 We rolled the shell out into the sun to get a few rays and how nice does the Viper Green look in the sun? 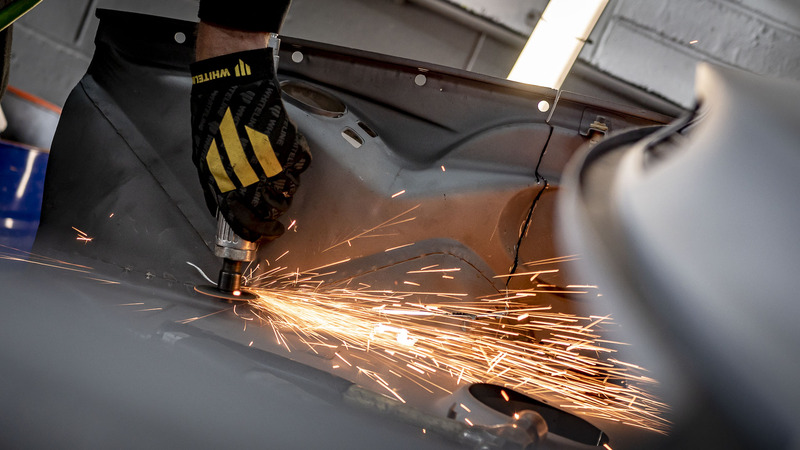 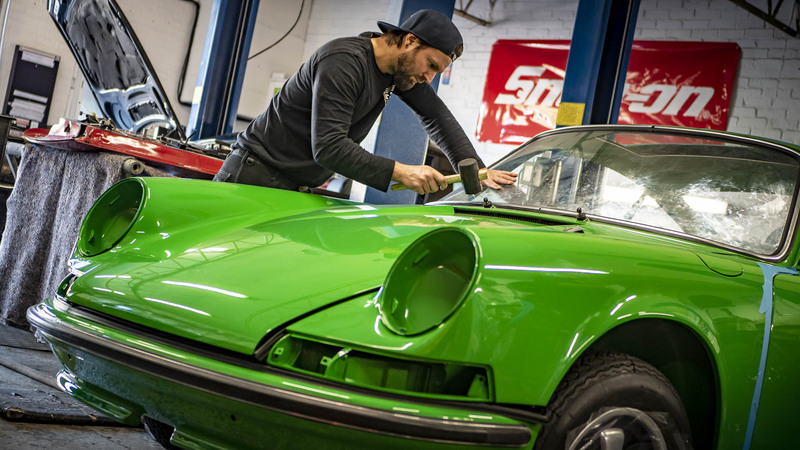 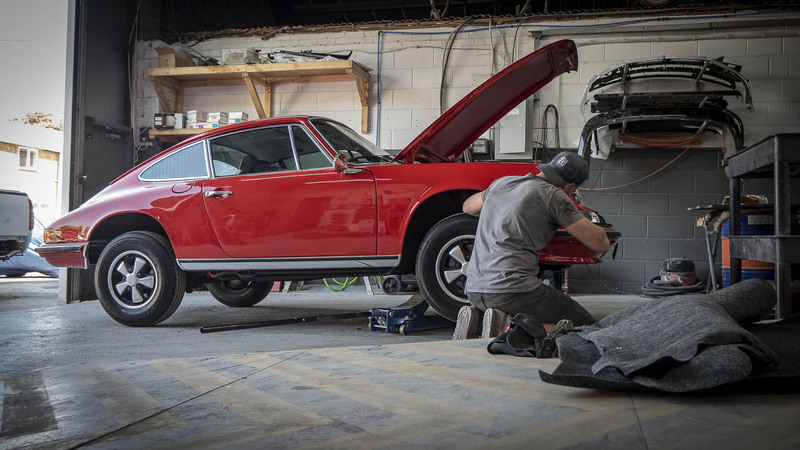 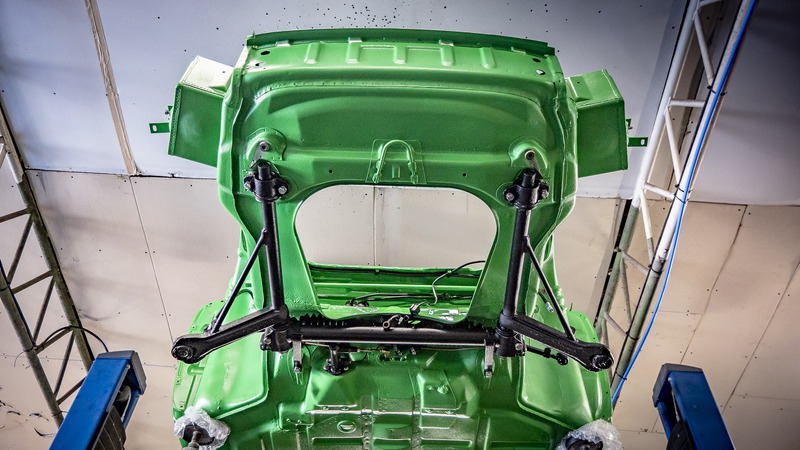 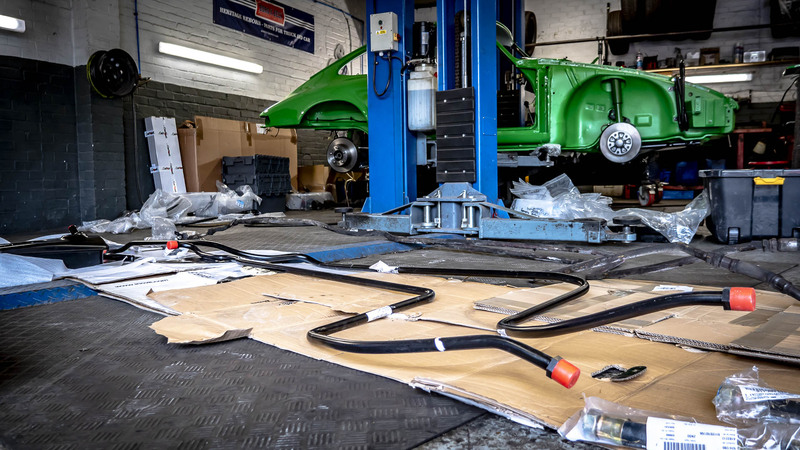 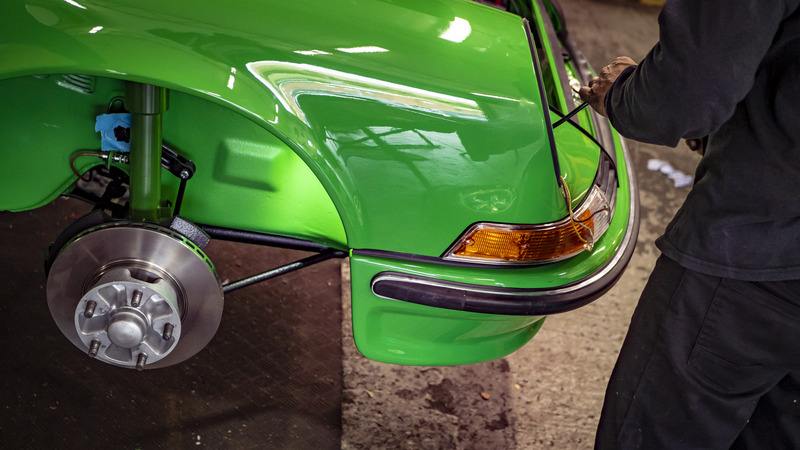 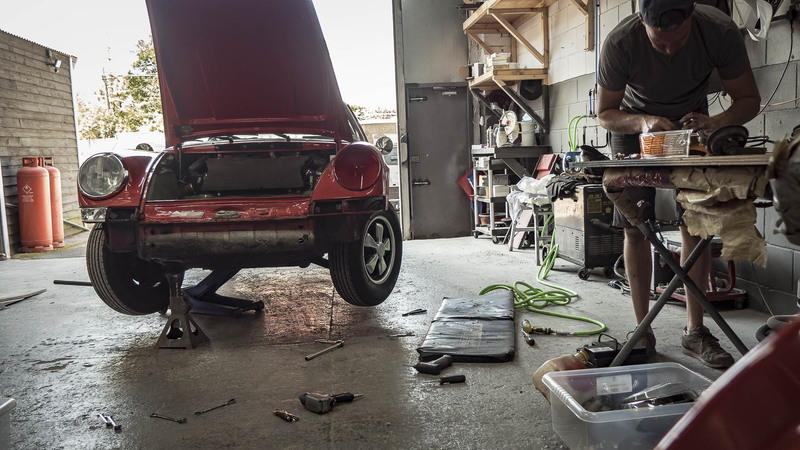 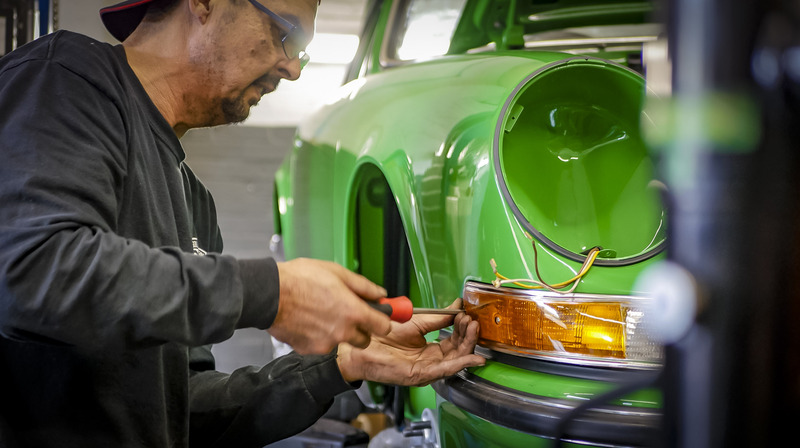 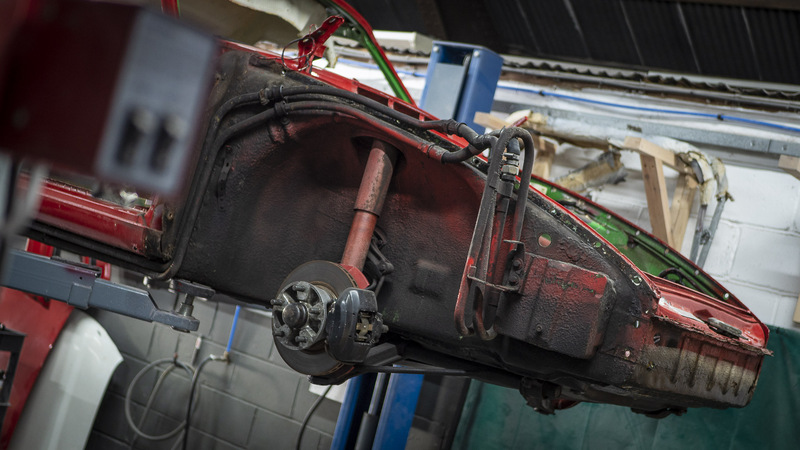 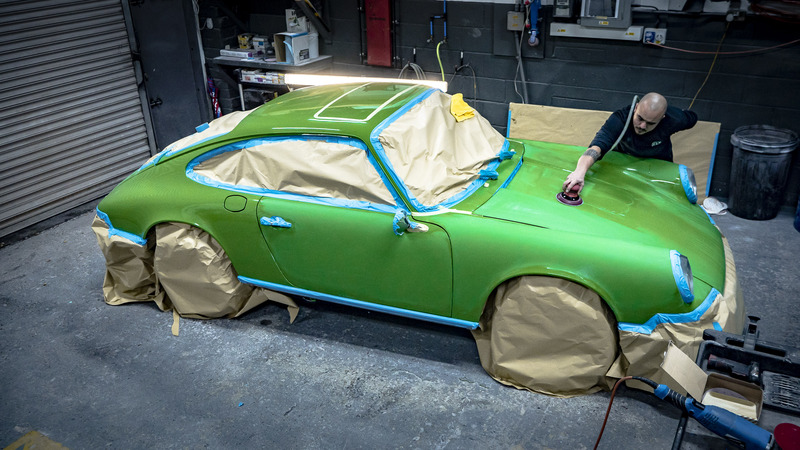 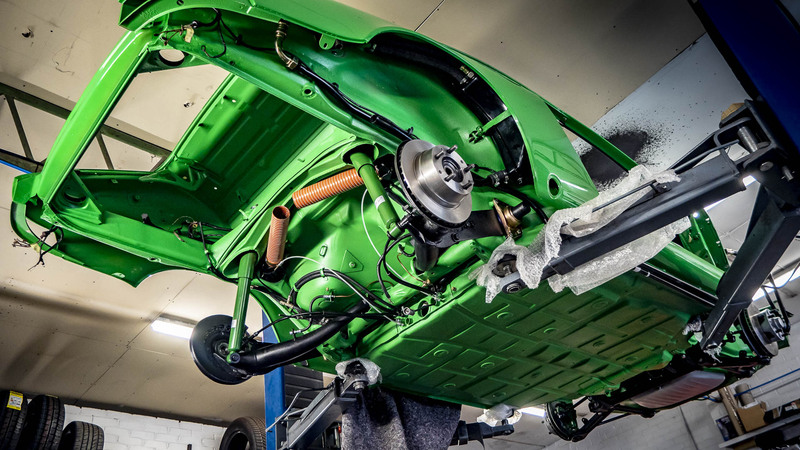 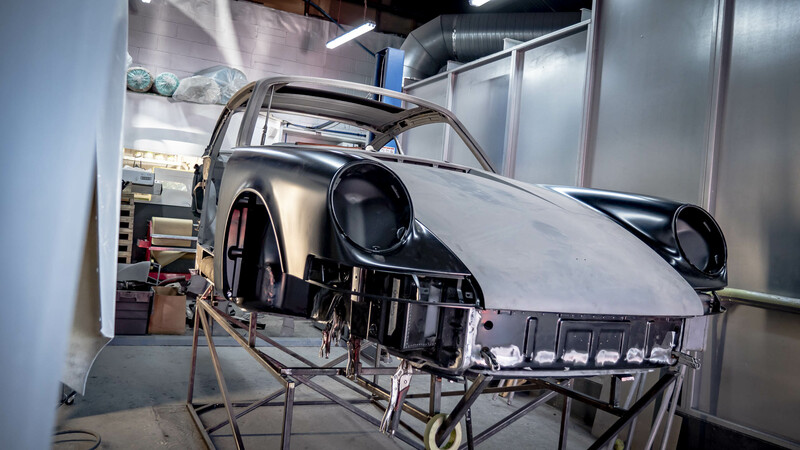 The 911s has now been rolled over to the GBG Garage, where Brett has started to add the wiring back in , cleaning up the original parts as he goes along. 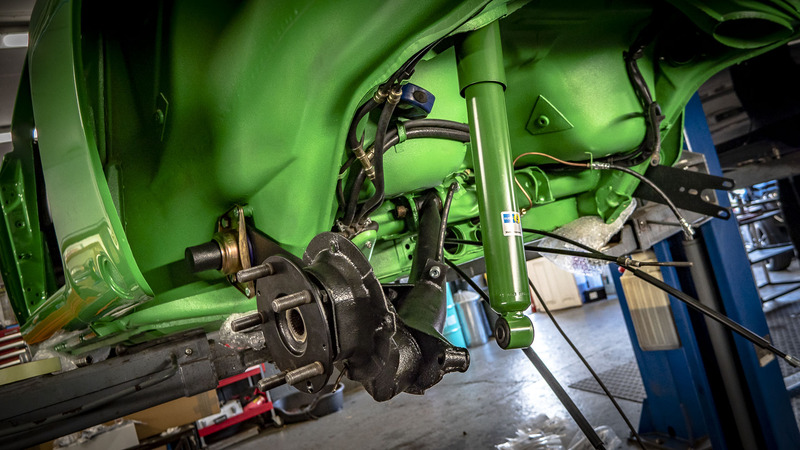 The front suspension, steering rack and discs have been fitted. 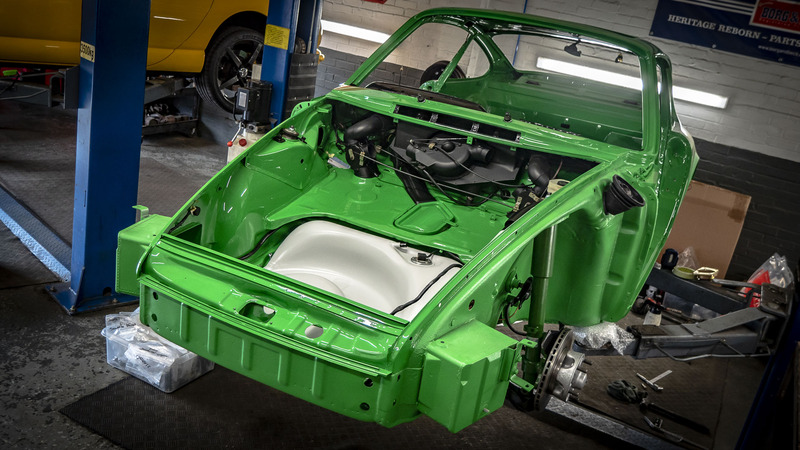 Any original parts Brett has cleaned up and restored before being fitted back on the car. 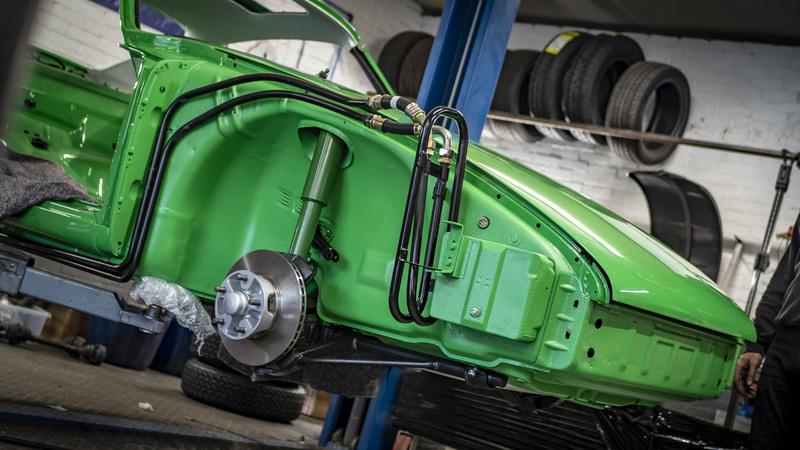 The rear suspension, brake discs, liners, hoses and discs have been fitted. 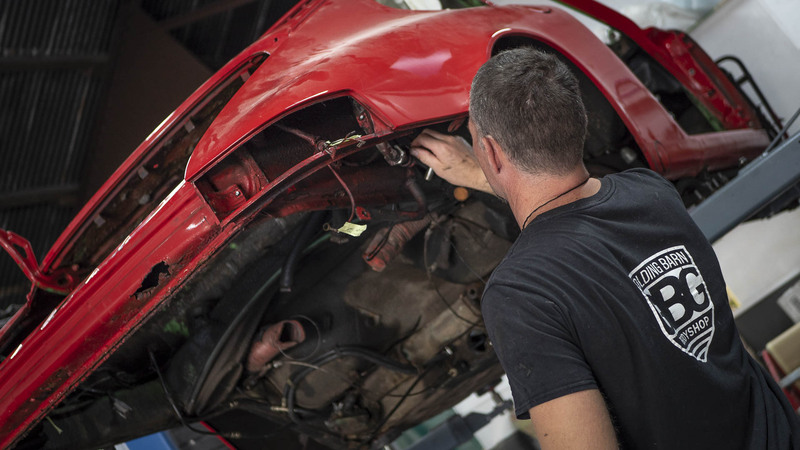 Again any original parts Brett cleans up and restores before being fitted back on the car. 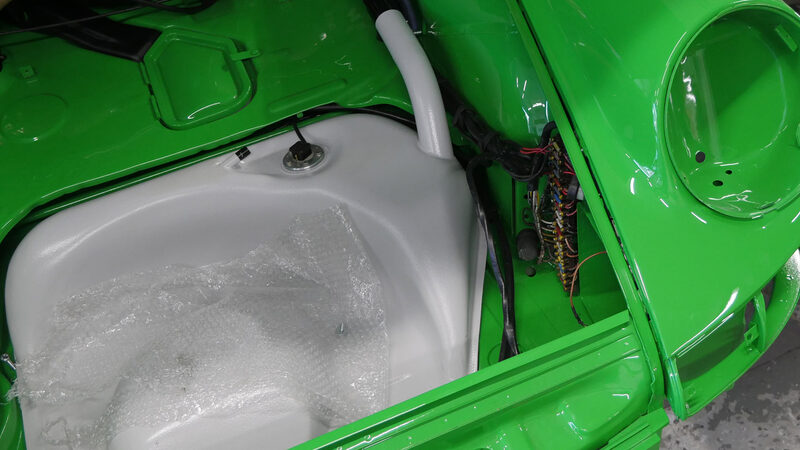 The fuel tank has been fitted, which the guys in our bodyshop have coated in white coloured Raptor to give it added protection and a little bling. 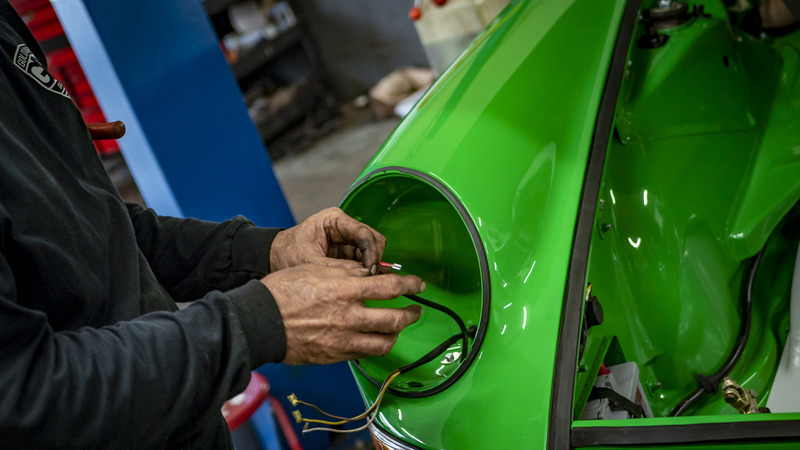 The headlining being fitted by the guys at SM Trimming. 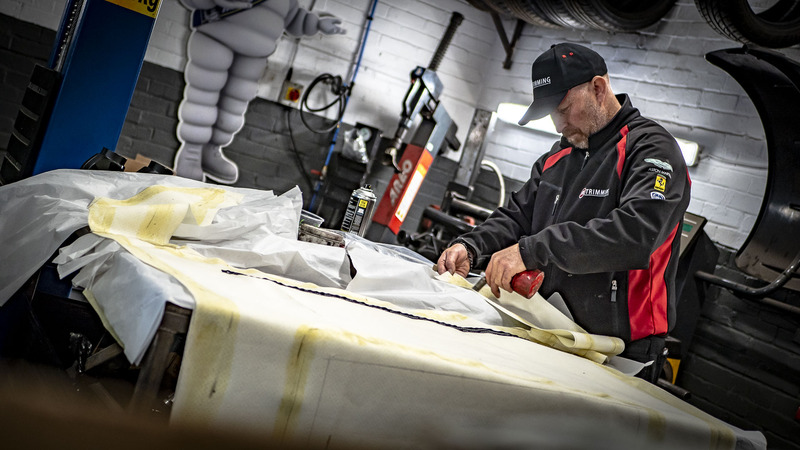 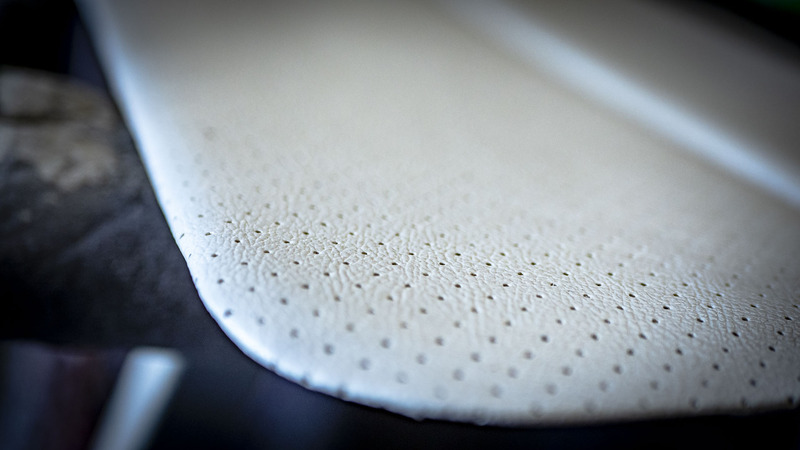 There was a slight upgrade on the original vinyl to Leather which was preferred by the owner but it retained the original white colour. 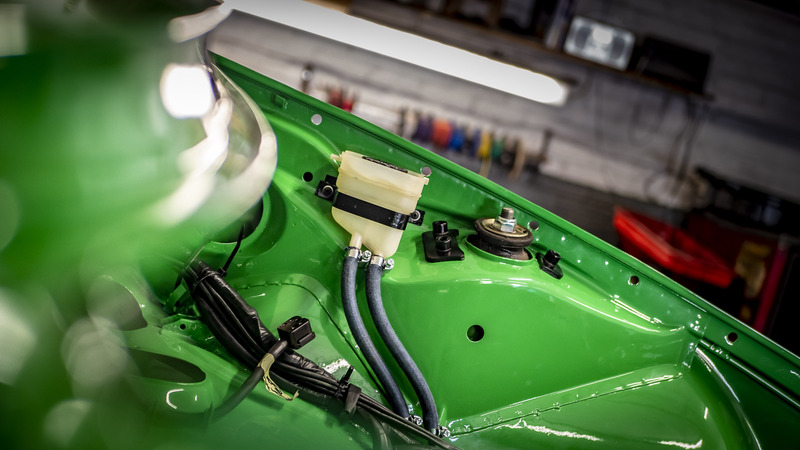 We have fitted a brand new oil tank that tucks under the rear wing along with all new pipes, replacing the tired old ones. 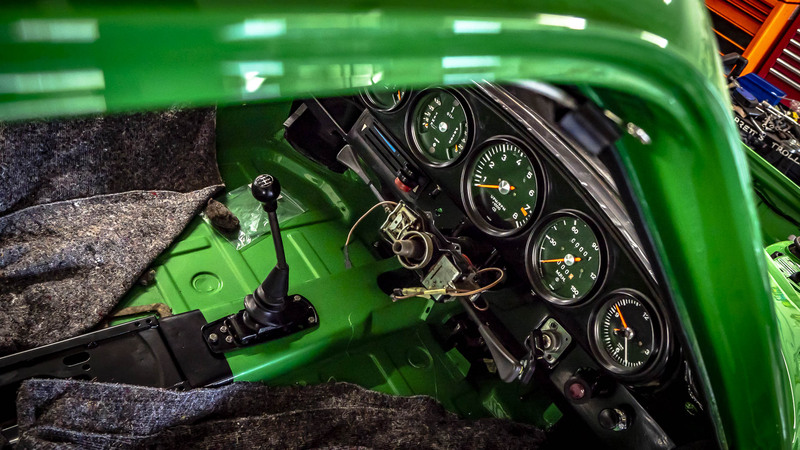 Bret has done a great job restoring the dials they look like they have just rolled out the factory. 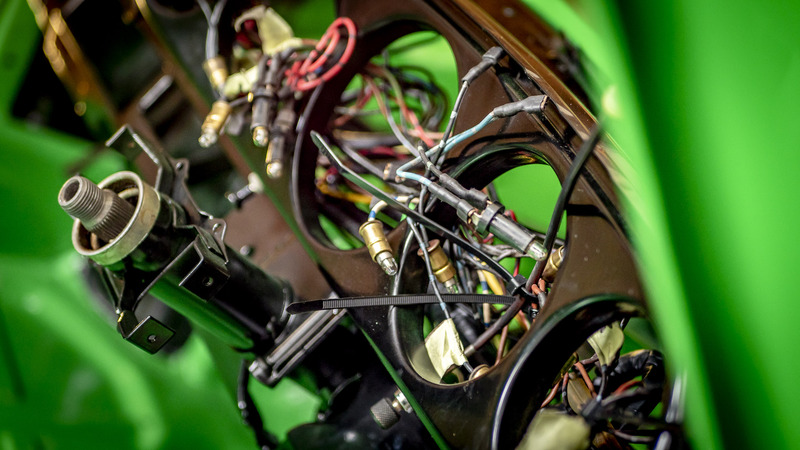 He has also fitted all the heating equipment. 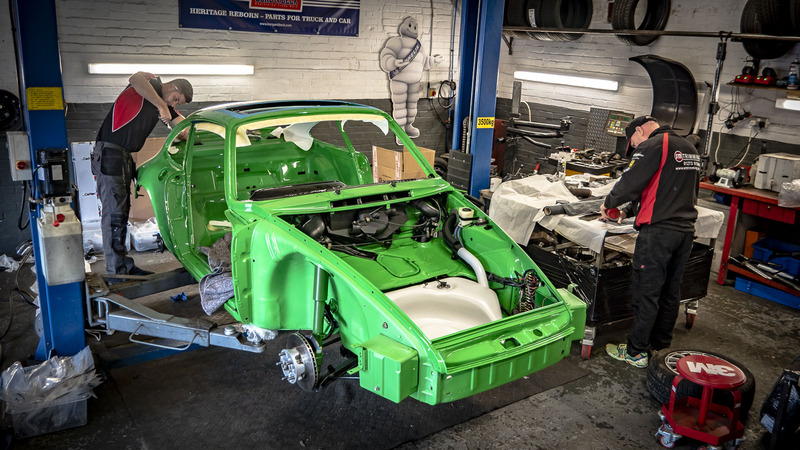 It’s always good to remind yourself where the project started, so before the wings and doors go on we thought we would show you some before and after shots. 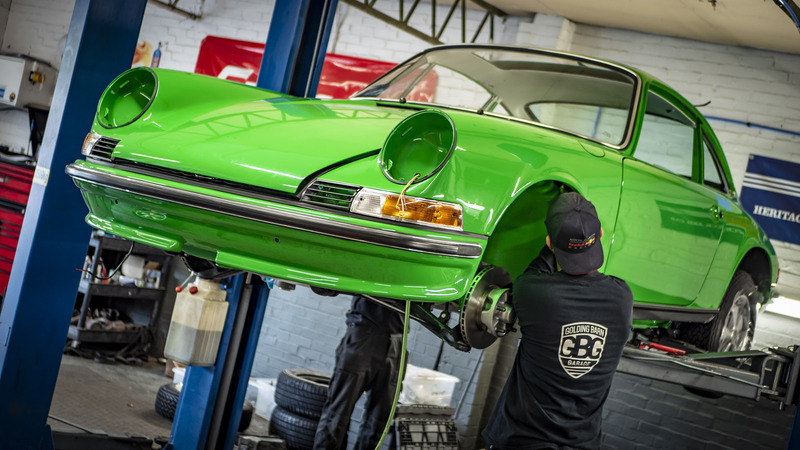 Big props to all the GBG guys who have worked really hard to get this very special car to the standard you see today! 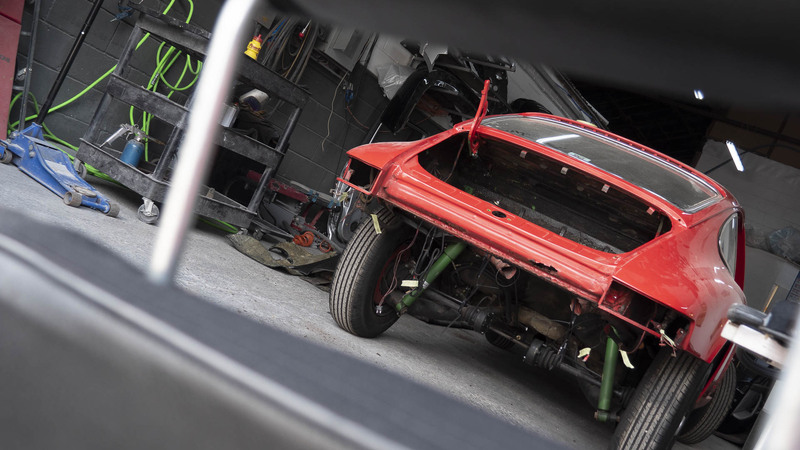 The wings, bonnet and boot have been fitted and its finally starting to look like a car! 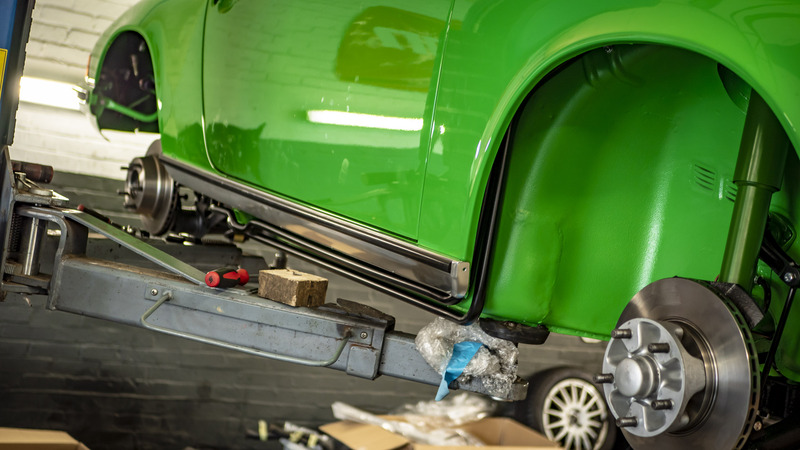 Finally we put the newly refurbed wheels on and dropped the car back on the deck for the first time in 3 months. 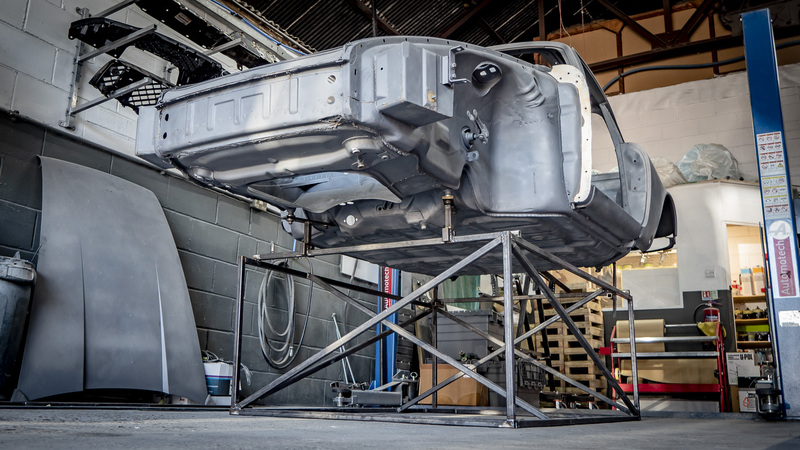 It is currently sitting a little high however the suspension will settle over time. 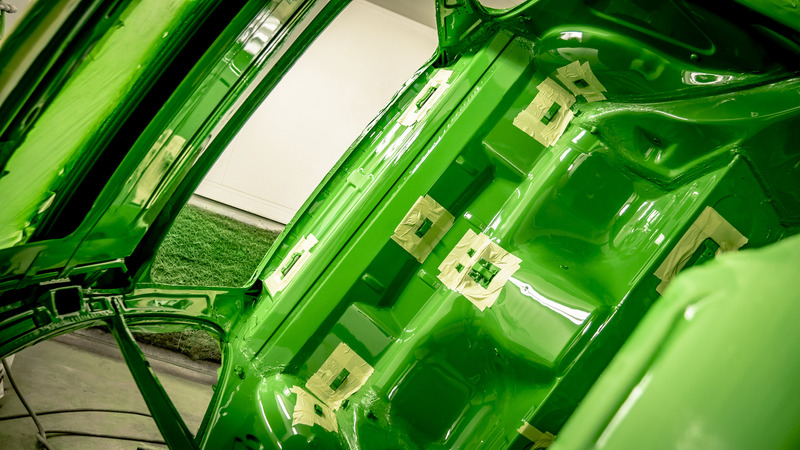 The doors and glass are being installed and it is looking like a car now. 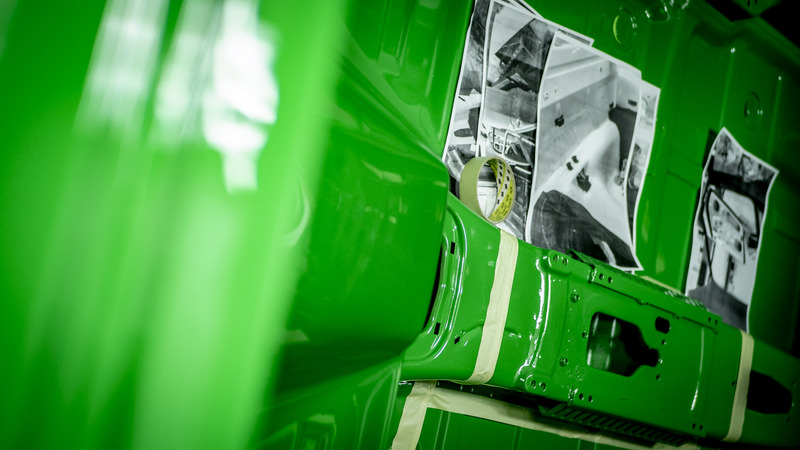 All the trim, lights, locks and badges have now been fitted ready to be wheeled over to the body shop for a final flat and polish. 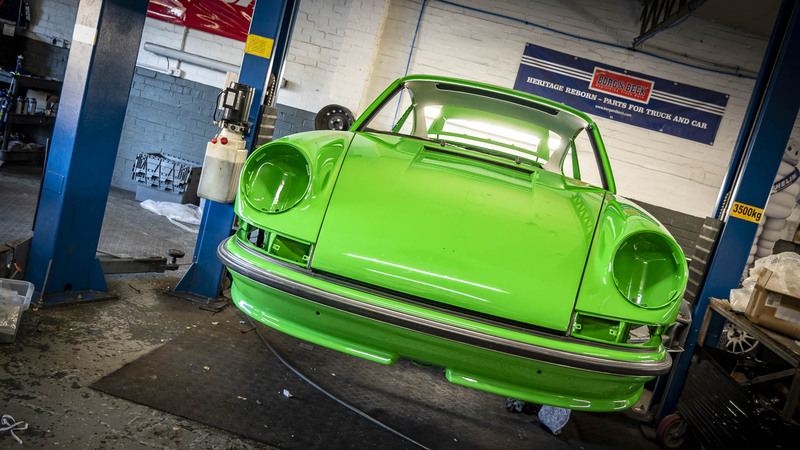 With the trim masked up the Porsche got a final flat and polish and i have to say it looked like the mutts nuts! 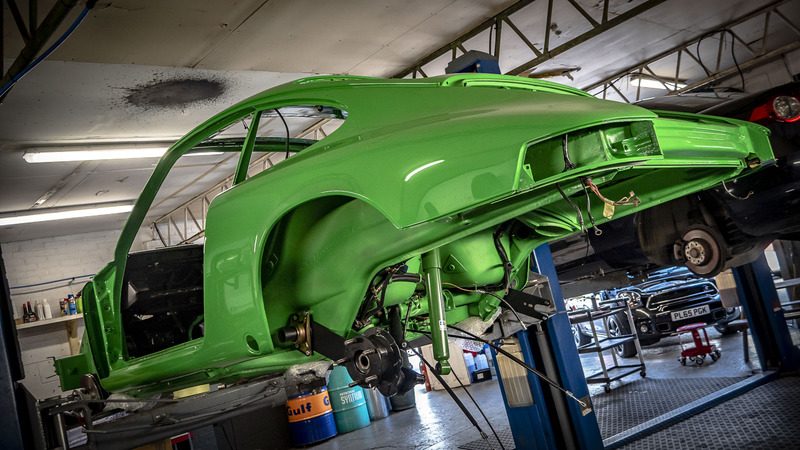 let us know what you think of the outcome in the comments section below, we would love to hear your thoughts. 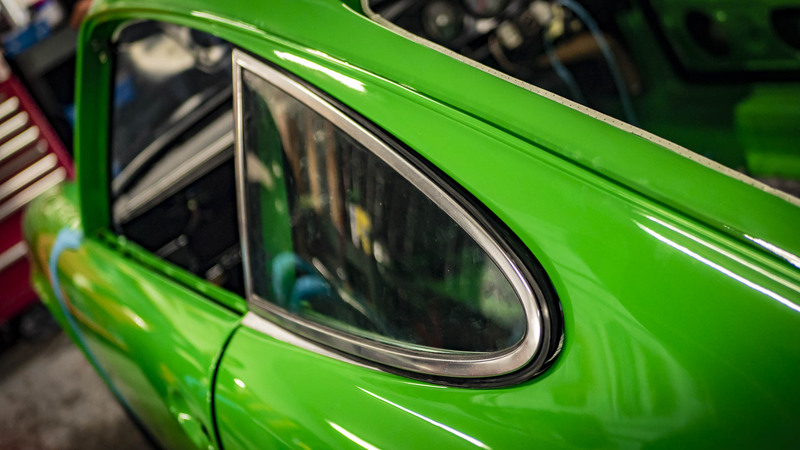 Once the engine and interior are fitted the car will be heading back to us for a full photoshoot in the new year. 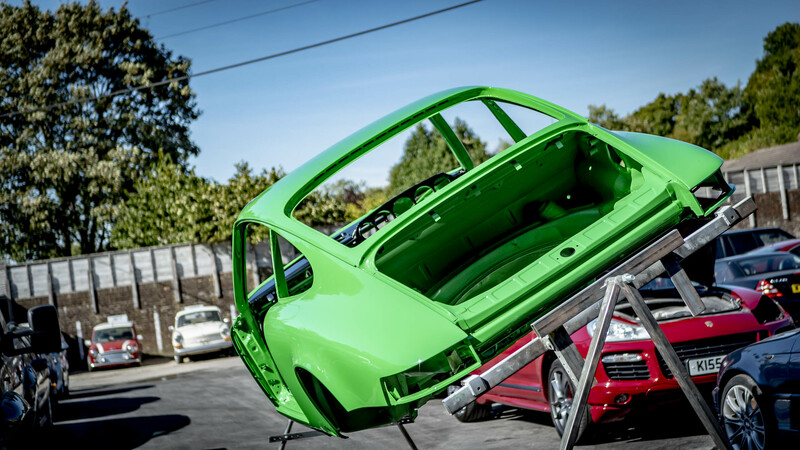 Can’t wait to see this complete. 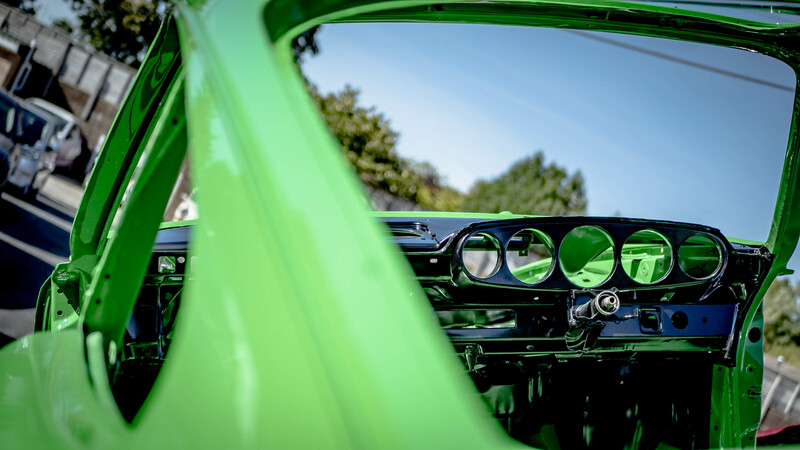 My car all day! 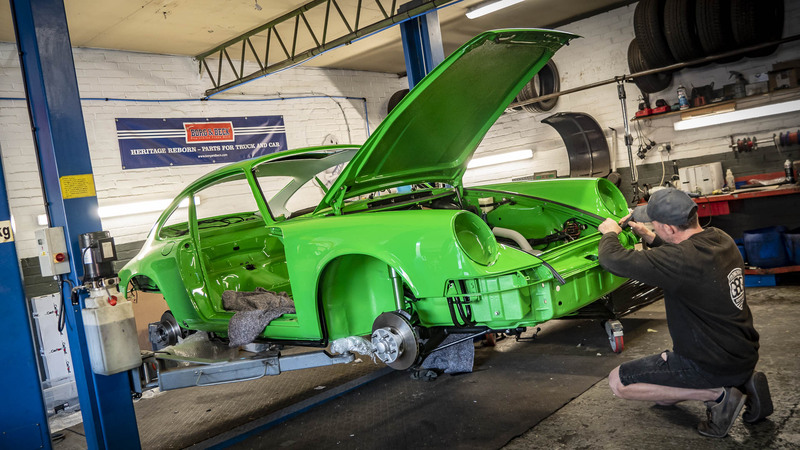 Fantastic work from you guys.. It’s great to see owners of car like these giving you the responsibility and budgets to bring these cars back to their formar glory… looking to seeing the to the final result. 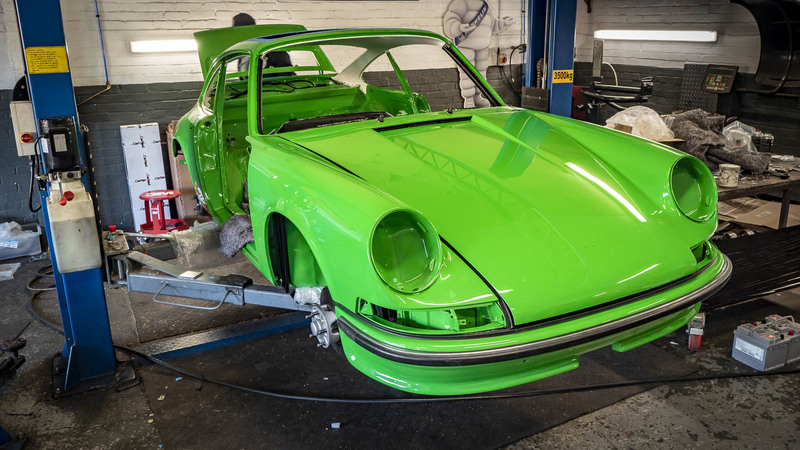 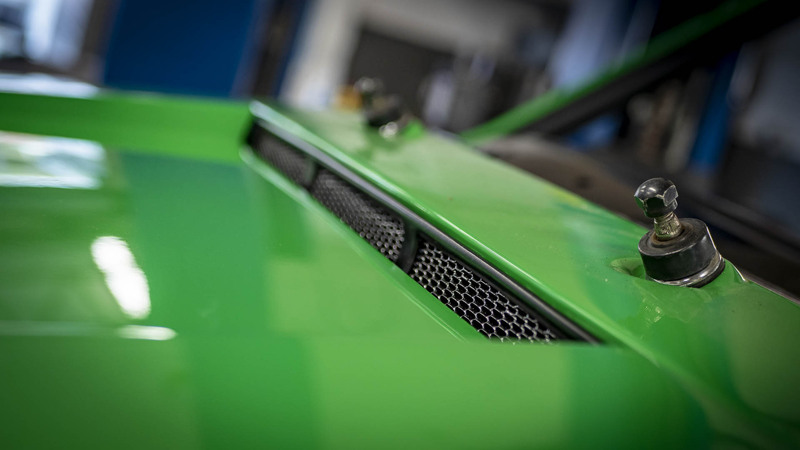 We do feel privileged to be working on such beautiful cars, this one specially being so rare we are really looking forward to the finished product. 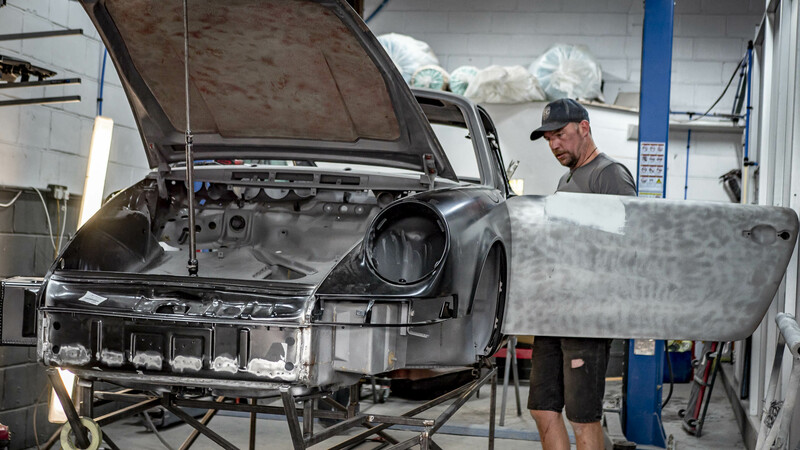 Loving all the hard work you guys have done already and wow does she look good. 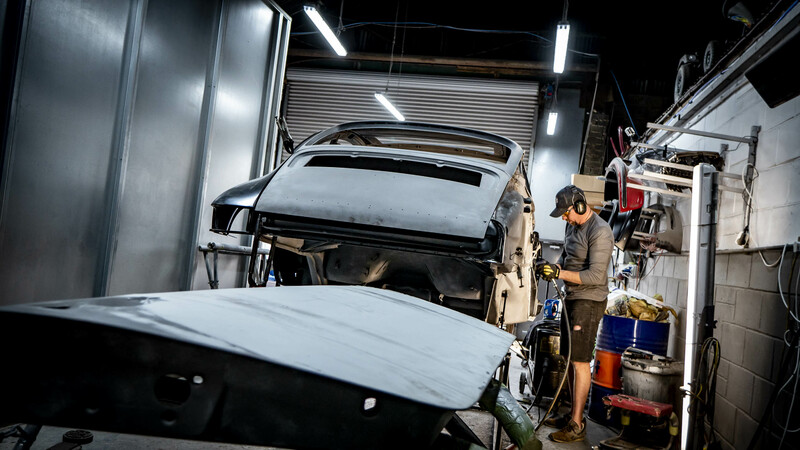 Really looking forward to see the next stages. 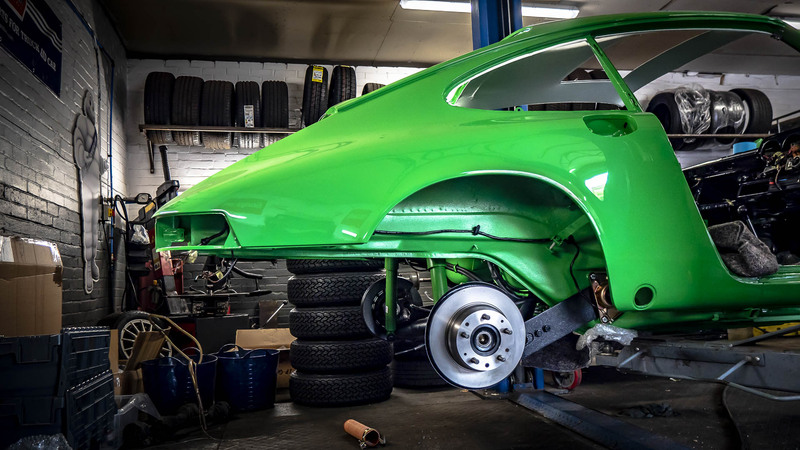 She is coming together nicely, and the colour is just striking in person! 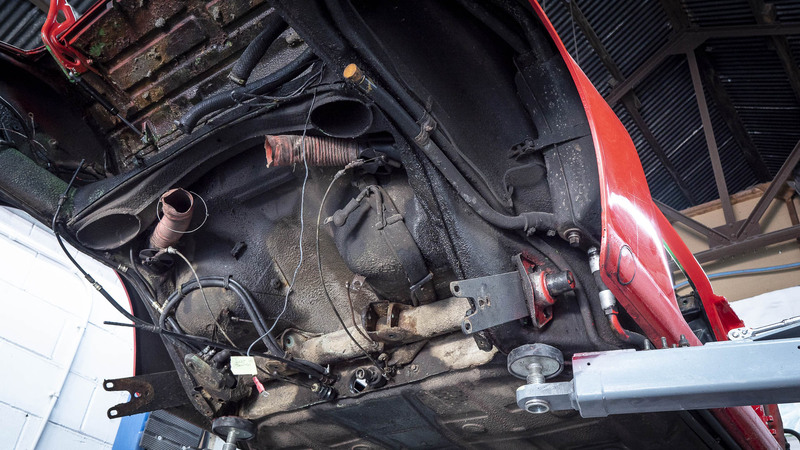 hopefully we can do her justice.